The bunkhouse was quite nice and I had no desire to head off in the rain so I decided to stay another day and make the most of the relative comfort. 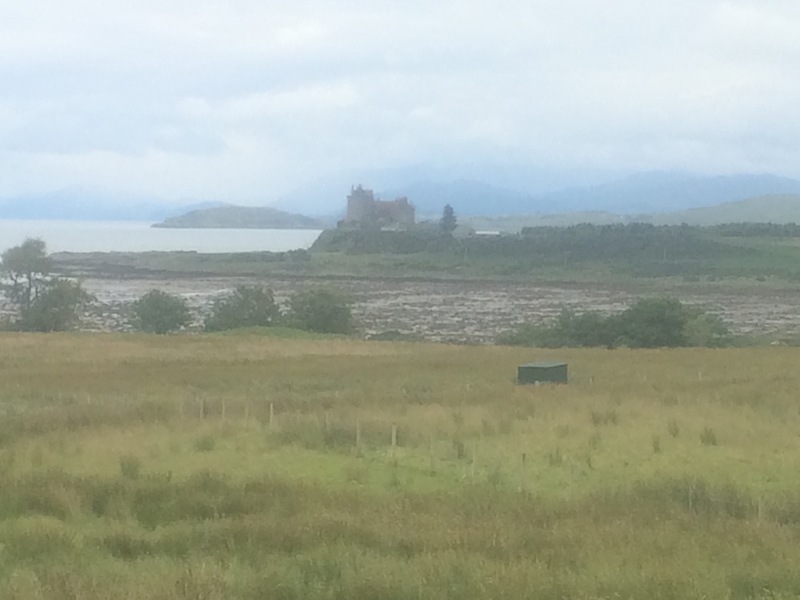 The bunkhouse was quite near to Duart Castle, the seat of the Clan Maclean who once ruled over Mull, Jura, Islay and part of Argyll, so I thought I’d take a look. The two old ladies staying in the bunkhouse were also heading there so I gave them a lift and ended up walking around with them. It is a well positioned castle, right on the NE corner of Mull where the Sound of Mull meets the inner seas off the West Coast of Scotland. It is almost opposite Oban. On a good day (which unsurprisingly this was not) you could see for miles and have a commanding view of all the sea traffic. 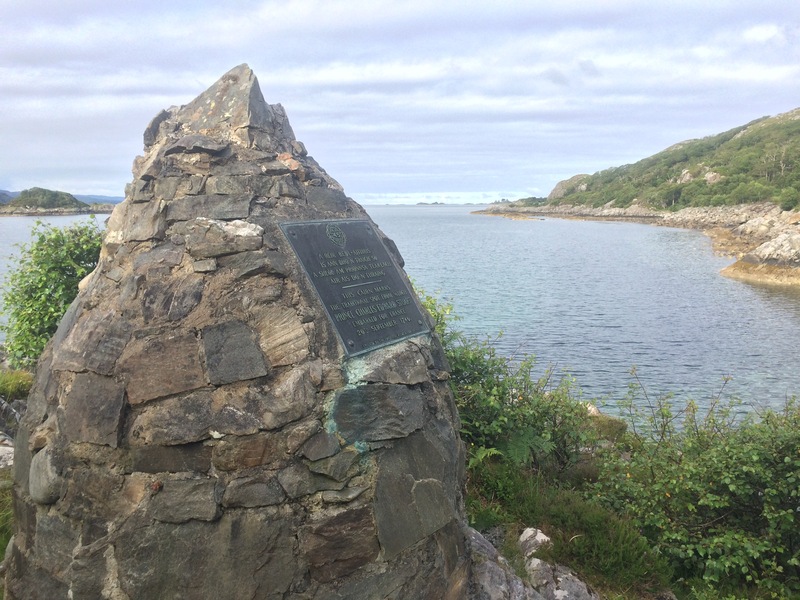 Apparently this was a stopping point for ships travelling between Ireland and Norway. The castle was interesting to look around and then I was treated to two coffees in the cafe where I listened to Jean and Rosemary’s stories for over 2 hours. They had both worked in social care in Glasgow and so were better versed in the world of prison and drugs than me. It was fascinating. 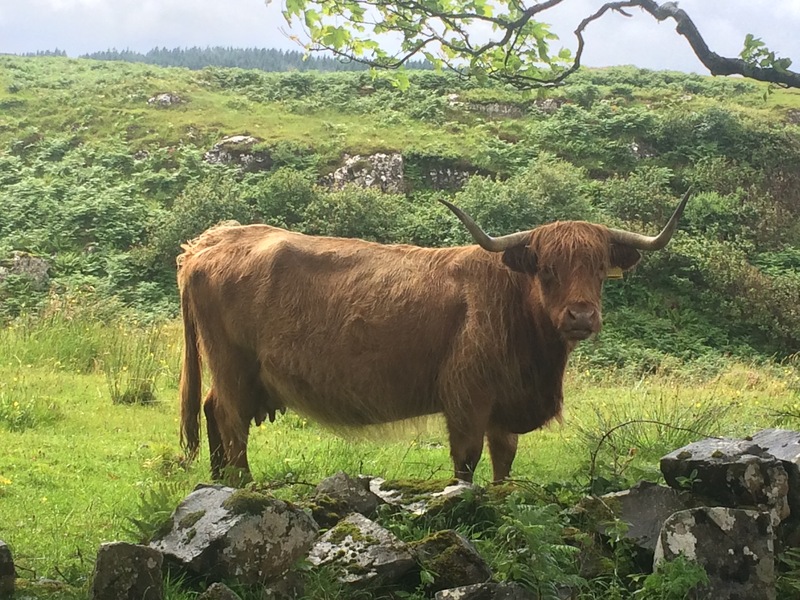 In the afternoon I drove them off the main road a bit and we went down to Lochbuie for a look. 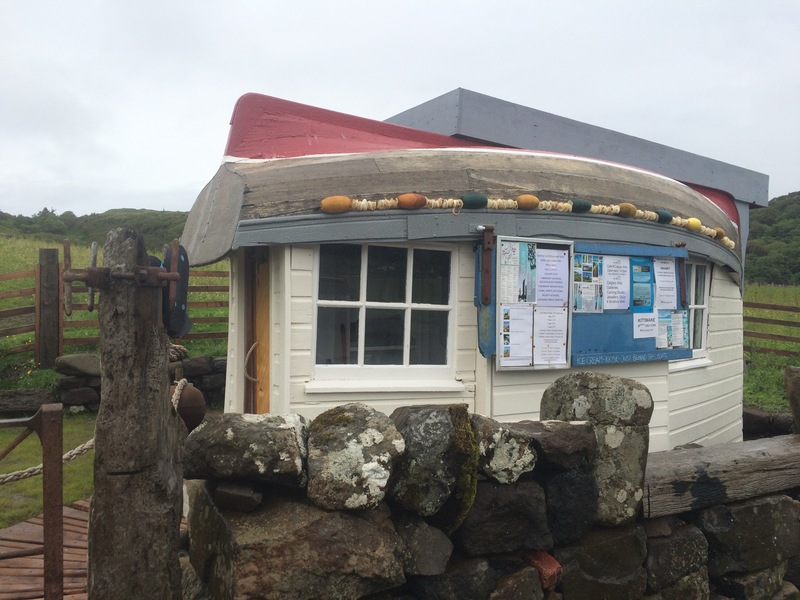 There was a small post office on the shore which operates on a help yourself basis with an honesty box. Jean and Rosemary had another coffee while I walked along the shore in the rain, just as far as Moy Castle. It had been a chilled day and I had enjoyed the company. In the evening I went to the pub next door for some food and a pint. It was still raining on and off. Sharing a room with 5 strangers meant I woke early. Unsurprisingly the sky was dark grey and it was pouring with rain but I decided to get going anyway. 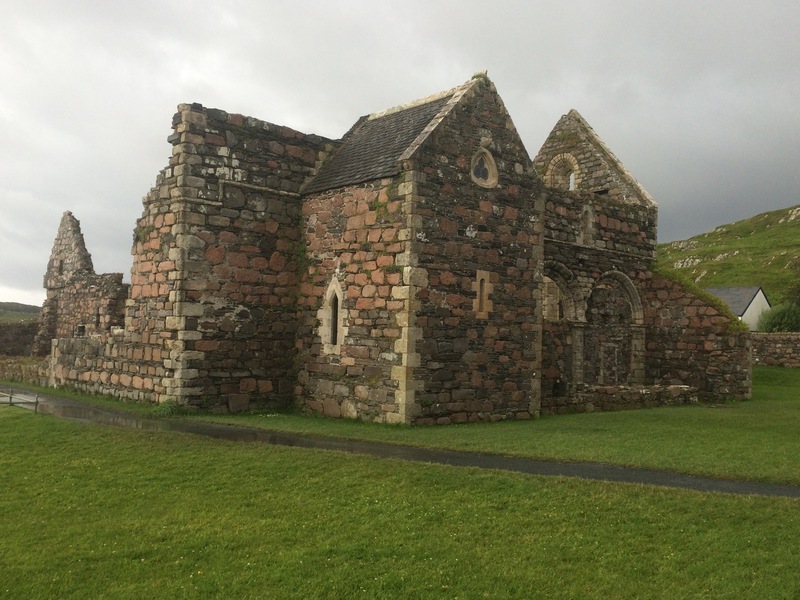 I wanted to visit Iona and had decided to drive a long, circuitous route around Mull to get there. The drive along the South side of Loch Na Keal and then around Loch Scridain was on a road that pretty much bordered each loch. I kept my eyes peeled for otters but no such luck. I saw lots of herons and a few other birds but not a lot else. I think most of the wildlife was sheltering from the bad weather. The drive was scenic, with water on one side and mountains on the other. I couldn’t see Ben More, Mull’s Munro, through the clag but it was nice driving the windy, up and down roads. I was reminded of the Lake District, which I think was because of the trees. 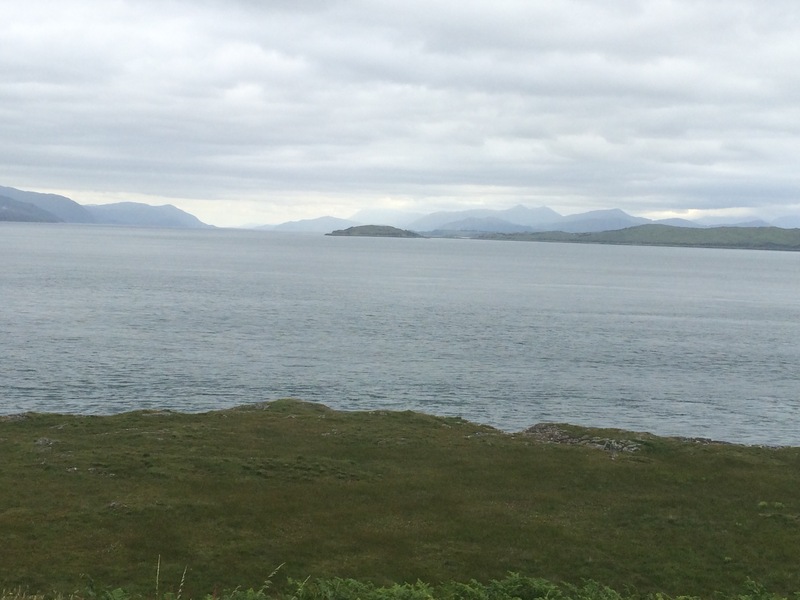 On any other day there would also be stunning views to Coll and Tiree. Waterfalls everywhere coming off the mountains…in summer! 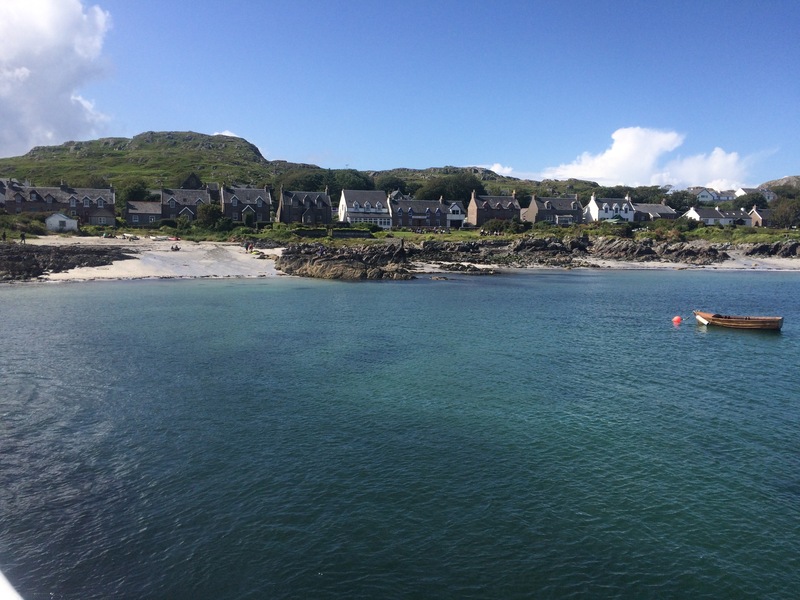 I arrived at Fionnphort, the tip of Ross of Mull, in time for the 9.55 am ferry across the Sound of Iona. The sky was very dark and the short 10 minute crossing was surprisingly rough. Having seen the influence of St Columba in Lindisfarne and around N Scotland I thought I ought to visit the island where his legend started. That’s a very dark sky over Iona! 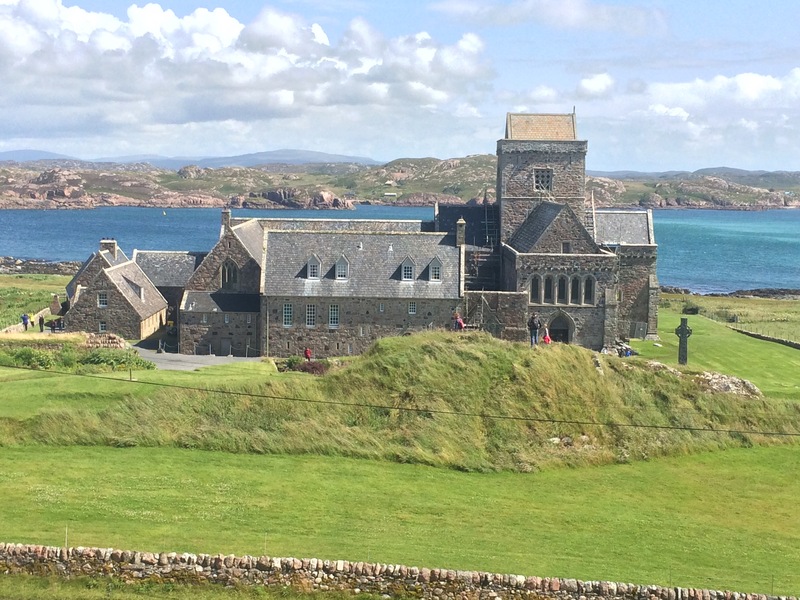 St Columba was from Ireland but arrived on Iona and founded the Iona Abbey in 563. 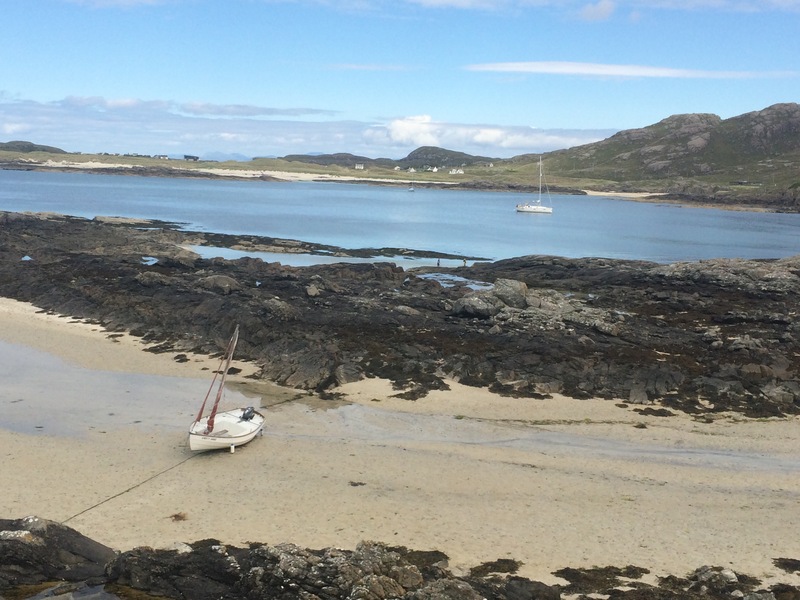 This small island still attracts pilgrims and has its own Christian community (the Iona Community) who fervently believe in pacifism and go on peace marches so I didn’t mention I am ex-RAF. 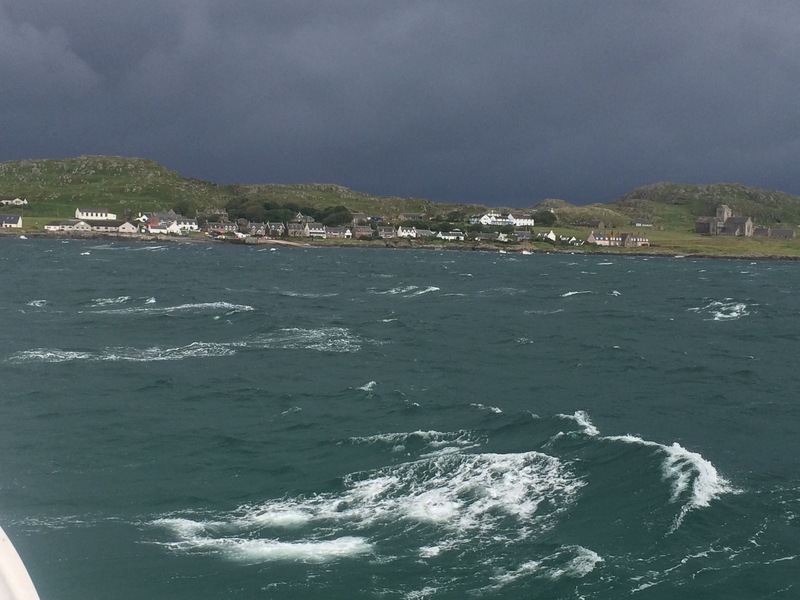 The sea around Iona has some fantastic colours: green through to black. It is pretty impressive, as is the sound the sea makes. Some people say it’s all quite spiritual; I thought the water was quite shallow and sandy, hence the wonderful green colour, and the large amounts of seaweed accounted for the darkness. The sky was so black that I went into the Heritage Centre next and enjoyed an hour reading about Iona’s history while the rain bucketed down. I emerged into a flash flood along the road, but I was dry. That was £2.50 well spent! 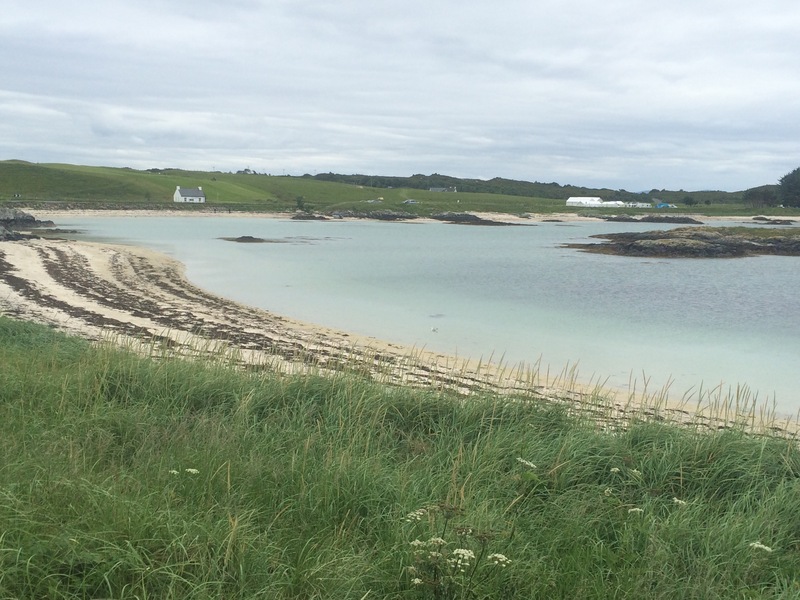 I was going to go to the Abbey next but all of a sudden there was blue sky and sunshine so instead I walked across the island to the West side (it’s a good 15 minute walk from one side of the island to the other) to the famous St Columba’s Bay. 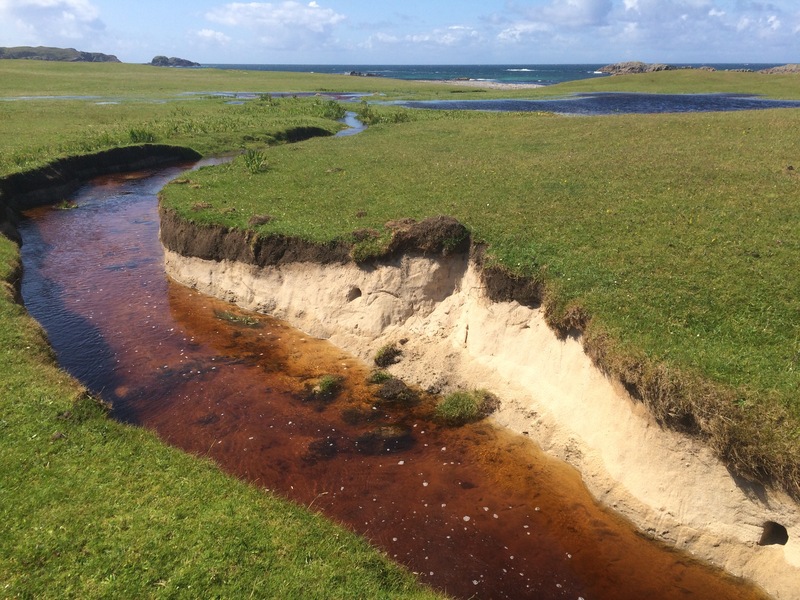 First I had to cross the Iona golf course – definitely not worth a trip to play on this course! 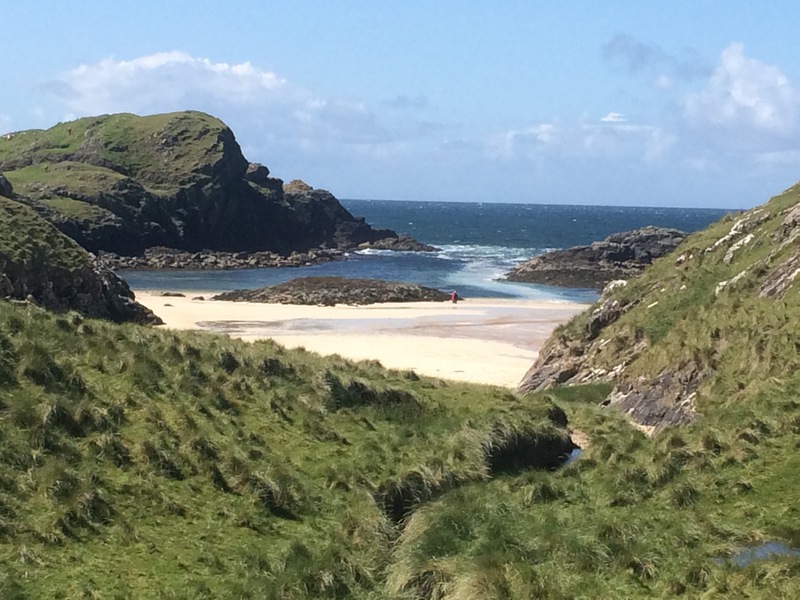 St Columba’s Bay was quite nice. I think I was expecting too much and have seen too many great beaches to be blown away by it. It’s mostly a stony beach with some white sand and the sea has lots of rocks and seaweed in it. The sound of the sea is supposed to be amazing?! 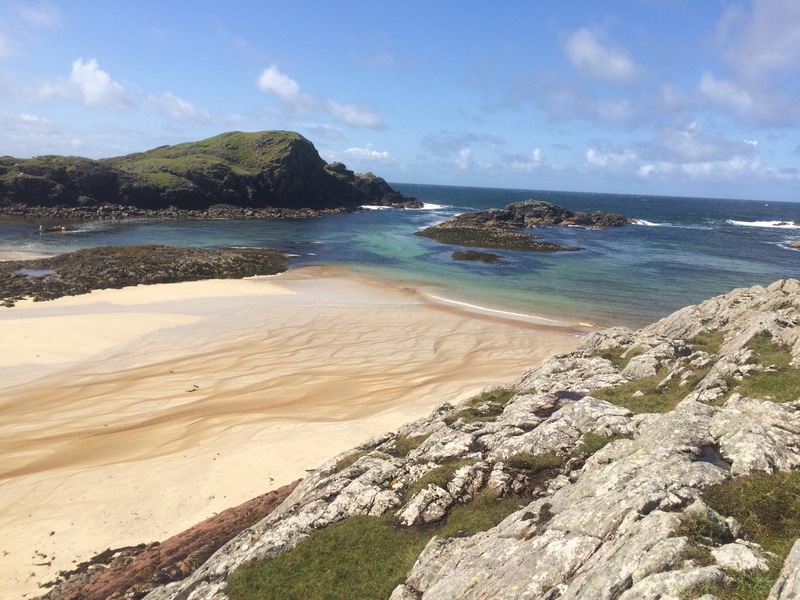 Just a bit further on from St Columba’s Bay is Port Ban, a smaller bay and this one has beautiful white sand and the sea looks amazing. There was a woman in swimming but I didn’t feel like it. Although the view was wonderful, the sea had a lot is seaweed in it and the burn running into it was red with iron and that gave the sea a reddish tinge. Beautiful to look at but it didn’t call me for a swim. After sitting on a high rock overlooking Port Ban for an hour I walked back across the saturated golf course and headed for the Abbey. 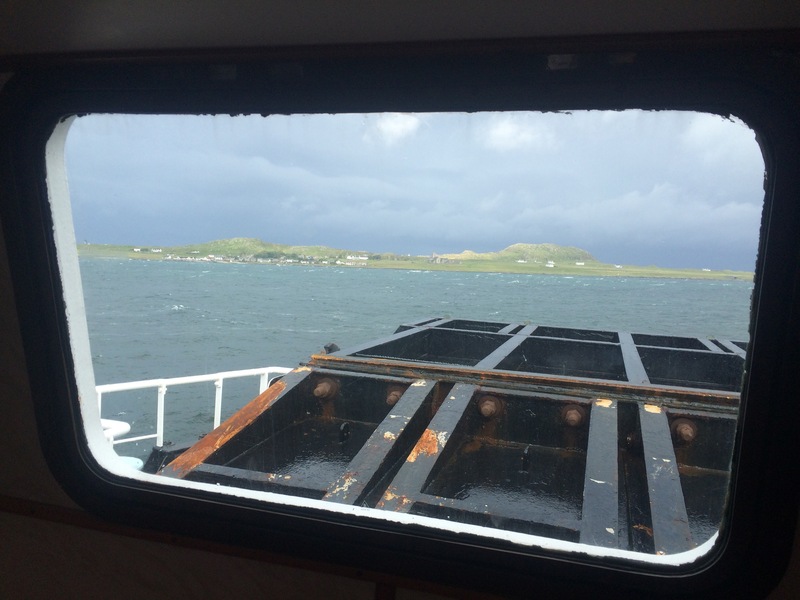 It was early afternoon and more people were arriving with every ferry; it reminded me of my trip to Lindisfarne. 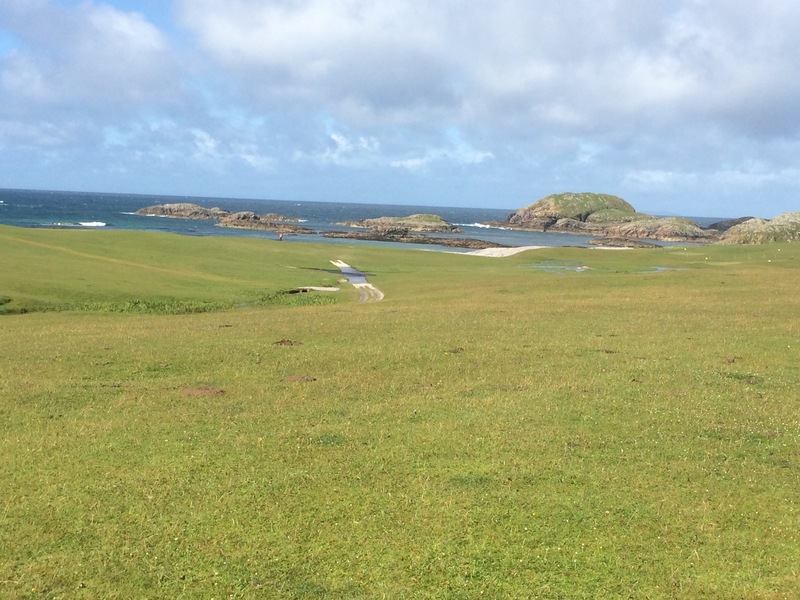 The Abbey is the main draw on Iona and also houses people on Iona Community courses. It is not the original Abbey that St Columba founded in 563 but is the 1900s version. It is still clearly a place that is venerated by many people but I was just interested in the history, not the spirituality. Just as I was thinking I’d had enough I saw a ferry coming in so I hurried down to the quayside to get on it. This time the water was calmer and I could see the sand beneath and some fantastic hues of green and blue. 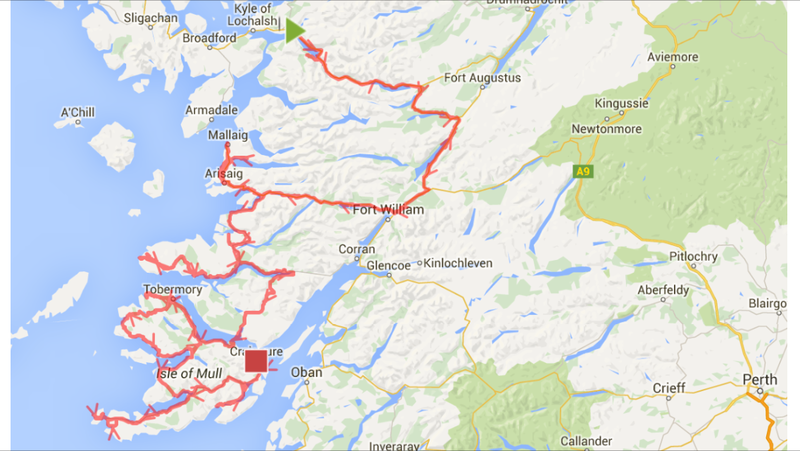 Once back on Mull I headed a bit further South to look at a couple of beaches shown on my map. I had been told the beaches at Ross of Mull were fantastic so I diverted to take a look and this one was rather nice. 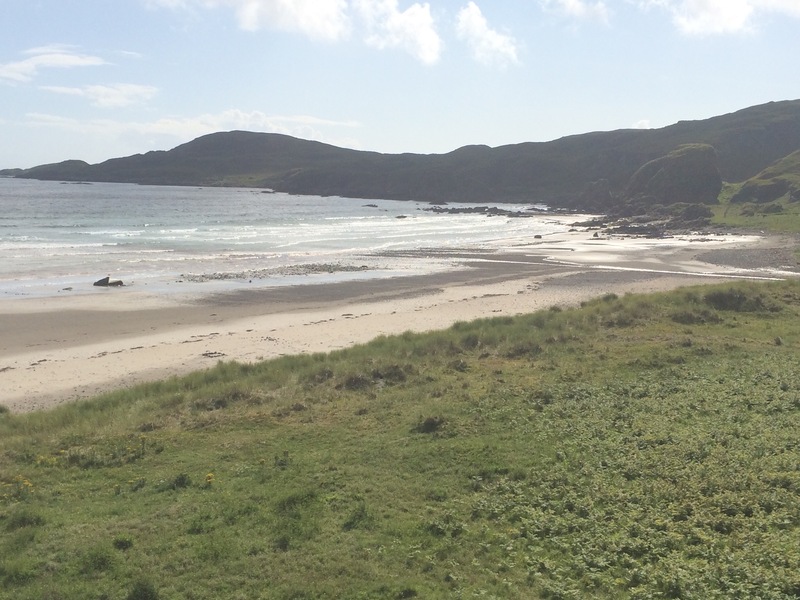 Behind the beach was Machair grassland, which is a protected habitat and gives the beach a sheltered feel thanks to the grassland and dunes. 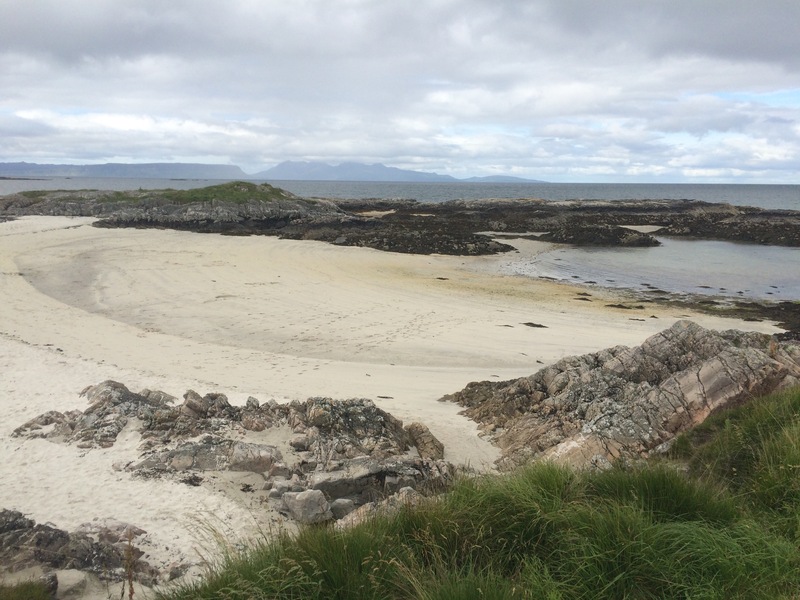 I think the beaches on the West coast of Arisaig, Ardnamurchan and Mull are all quite similar, it’s just that some are bigger and more remote. The cloud was coming back as I drove across the Island, along Glen More to Craignure. 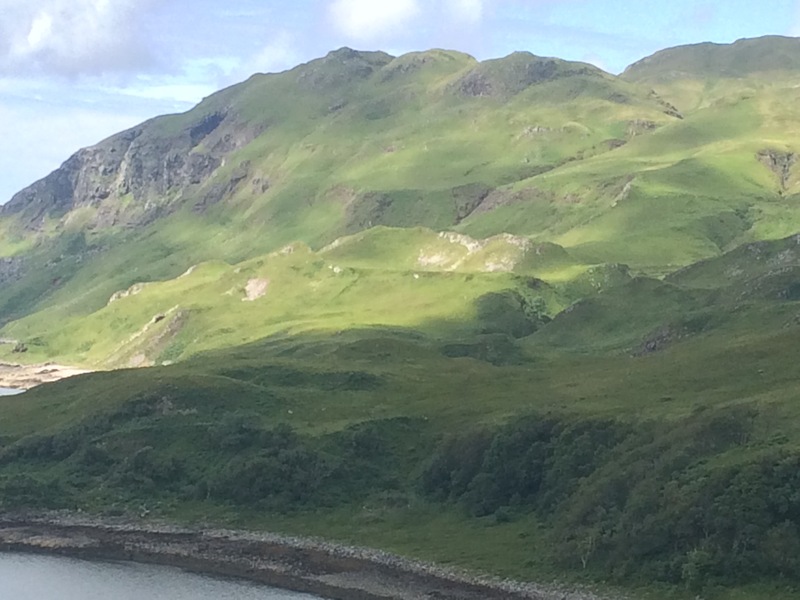 I would definitely like to come back to Mull. I reckon this would be a great island to walk around and perhaps then I would see some of the wildlife that eluded me this time, including otters, red deer and eagles. 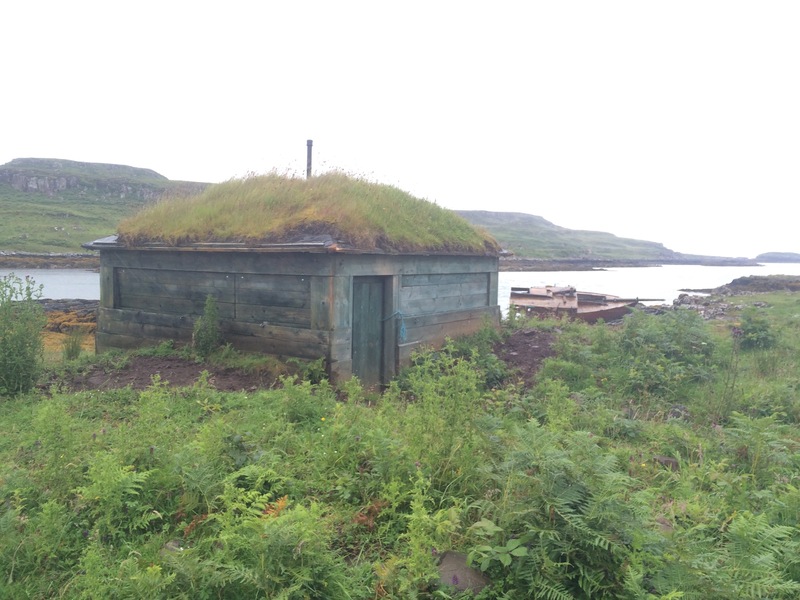 Craignure Bunkhouse was a nice surprise as it was modern, clean and hospitable, and I was able to do some much needed laundry. I was sharing a room with 2 old ladies, Jean and Rosemary, as well as another lady. Two French girls turned up late having missed their bus connecting so, in the absence of the warden, we found them some bedding and fixed them up in our room for the night as we couldn’t just turf them out. Jean and Rosemary were a hoot and Jean was telling stories late into the night. She has been hostelling for 61 years (she’s 77 years old) and seems to take all her holidays in hostels, sometimes with her children and grandchildren as well. She was a fascinating lady. I fell asleep to her stories and woke up to her snoring! 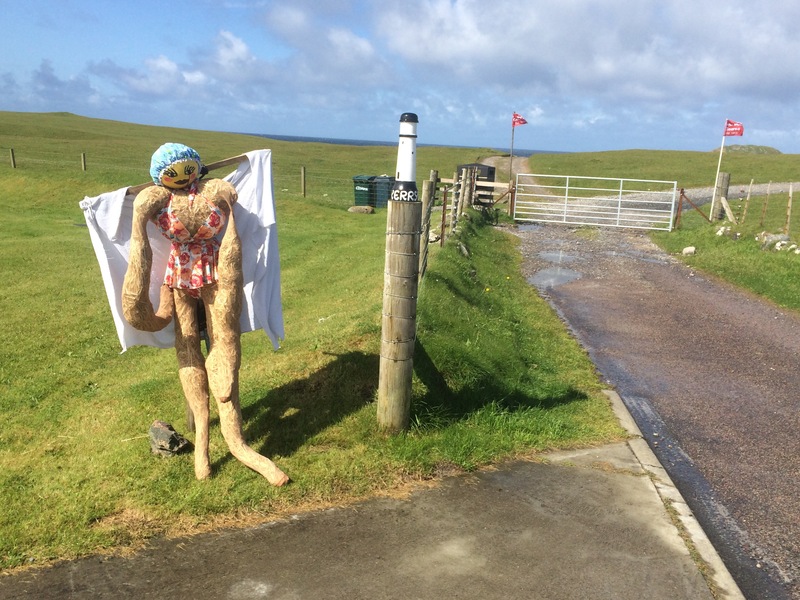 Around the Southern part of Mull (and Iona) many of the locals have put out ‘scarecrows’. These were two of the best. I woke to the sound of rain thundering on the roof of the Dive Centre. I had done some handwashing the previous evening and none of it had dried in the damp weather. I draped it all around the car, ate some cereal and headed off to catch the early ferry from Lochaline to Fishnish on Mull. The ferry had a technical problem that meant the 4 cars waiting to board had to drive on and turn themselves around. No problem with only 4 cars but there was a longer queue when we got off at the other side. I had done no research on Mull and had only bought a rudimentary map yesterday. I was therefore in the unusual position of having no idea what to go and see, no idea of where I was going to stay and no plan. 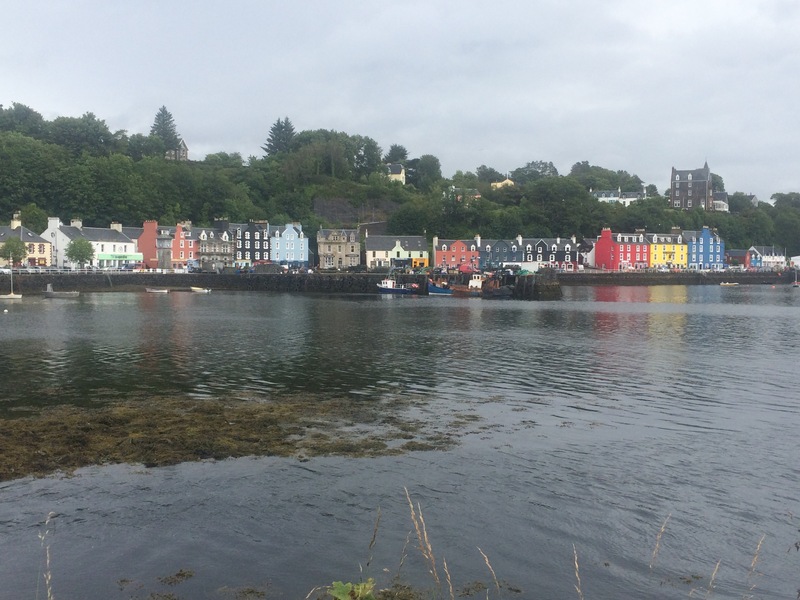 So I drove West to Tobermory, the main town. It has a pretty high street facing the harbour that is used for a well known children’s TV programme and so is now quite a well-visited place. It is pretty with all the buildings painted in bright colours. It was still pouring with rain when I parked and went to the tourist information point to find some accommodation. I had thought I would camp but the forecast is terrible for the weekend so I was lucky to get availability in 2 hostels. The girls in the Dive Centre (the owners were out diving so I only saw their daughters) had recommended the Tobermory Bakery and the Chocolate Shop. I went to the Bakery for coffee and a croissant; very nice too. The man at the ferry terminal/tourist information had recommended a couple of walks and things to see. 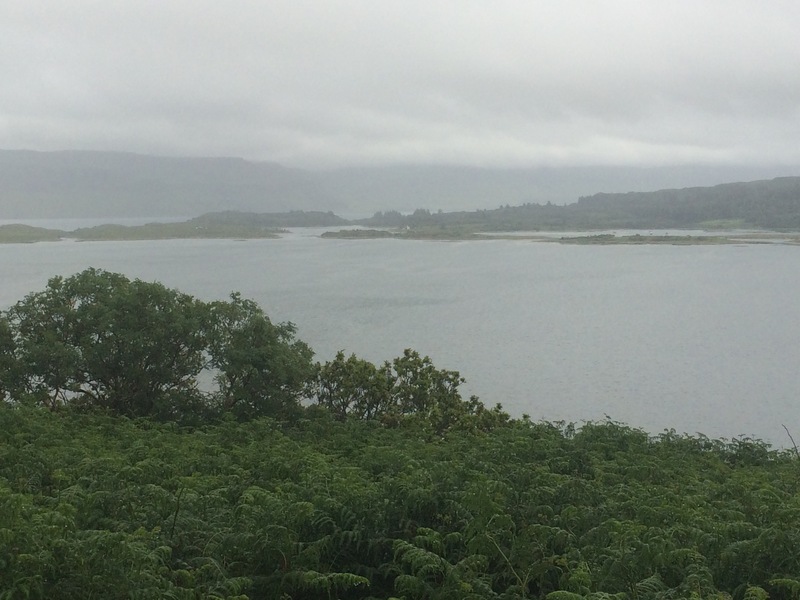 Mull has more forest than the rest of the West Coast and this seems to have attracted Sea Eagles and Golden Eagles. It would be amazing to see one of them. 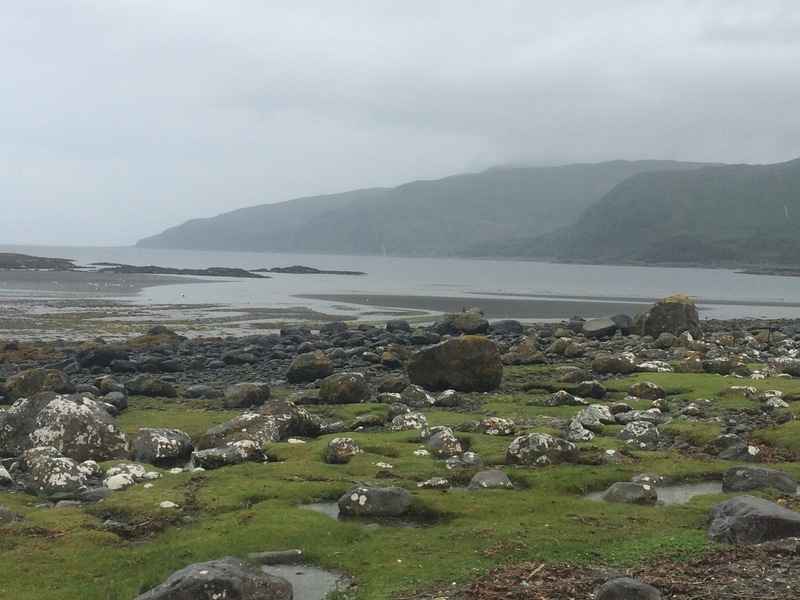 I didn’t know that Mull has lots of wildlife, including a large otter population. 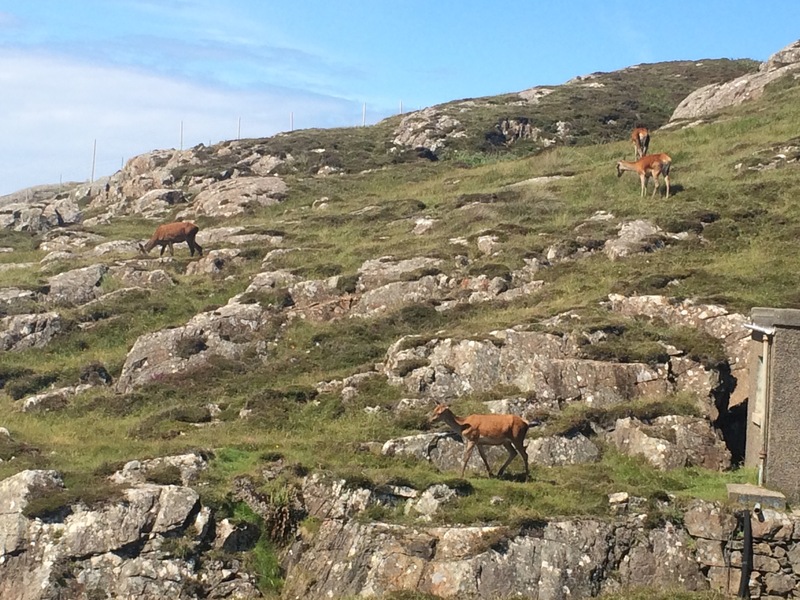 I guessed that Mull had lots of wildlife when I drove through the small coastal town of Salen and saw loads of birds right by the shore. There was even a road sign telling me to beware of otters running across the road. I got a great view of a buzzard that was sat pretty close and just looked at me. 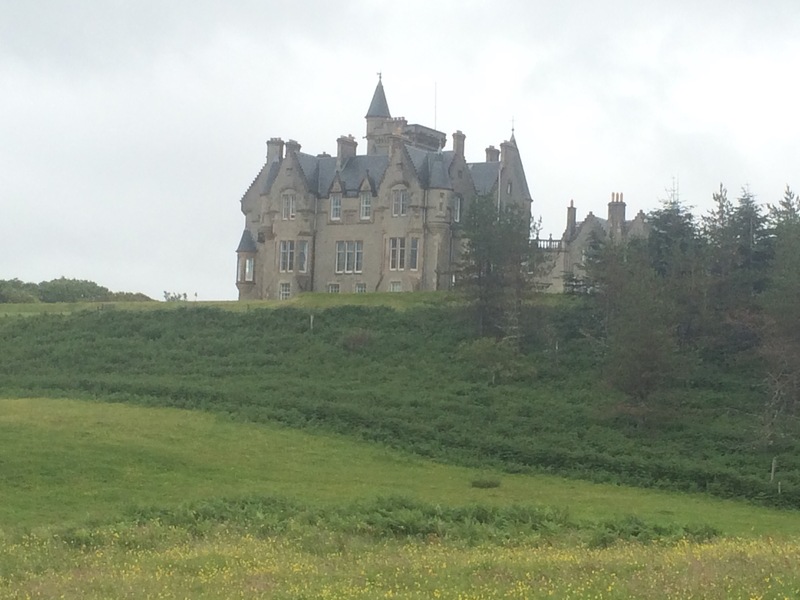 I drove to the NW corner, near Glengorm Castle (which is a hotel) and went for a walk. Past the Castle there is a set of standing stones (there are many around here) and further on there is some forest (possibly with Eagles) and the small Mingarry Loch. 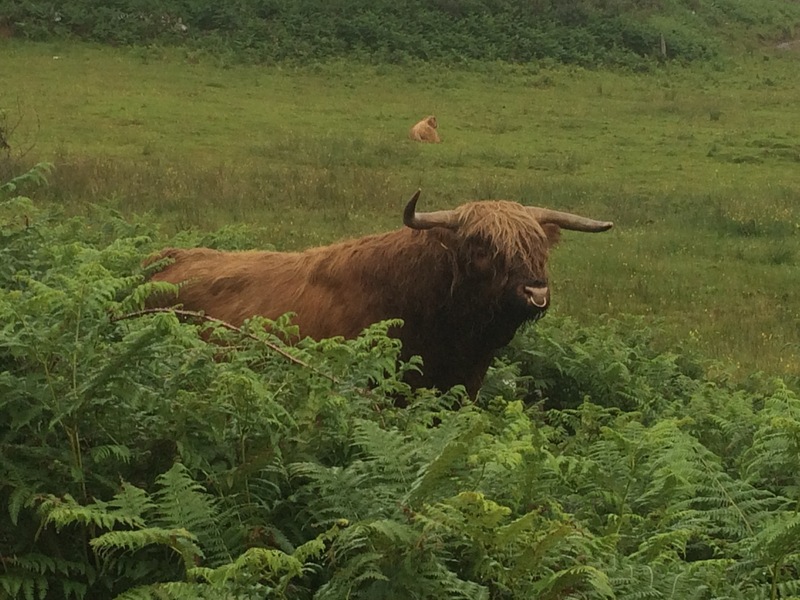 There were lots of Highland Cattle wandering around, including calves and a bull, but they just looked at me through their wet shaggy fringes. 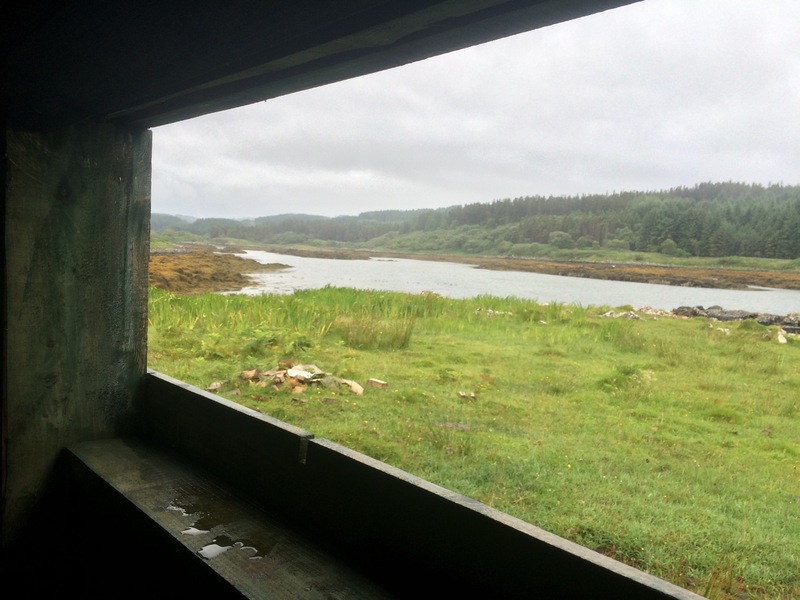 After half an hour I was soaked through but carried on to Loch Mingarry where I found a nature hide. I took shelter in it and spent almost an hour watching for wildlife. It was not as good as if I’d had binoculars; I think even the birds were hiding from the rain. I saw lots of herons fishing, a curlew, geese, a few gulls and Oystercatchers, but no Eagles or otters. Ah well. Back at the car I had more wet clothes to drape everywhere and so I drove off in my Chinese laundry. 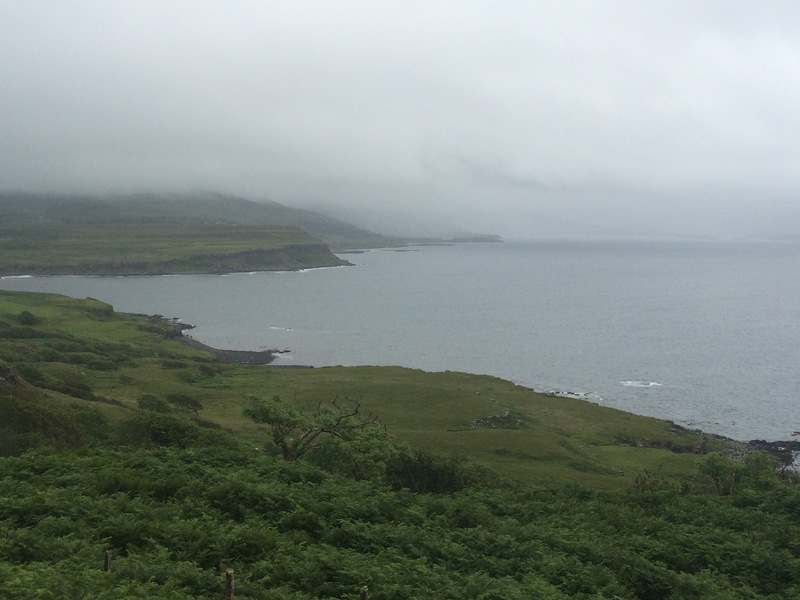 I spent a couple of hours driving a circular route that took in most of the West Coast of North Mull. 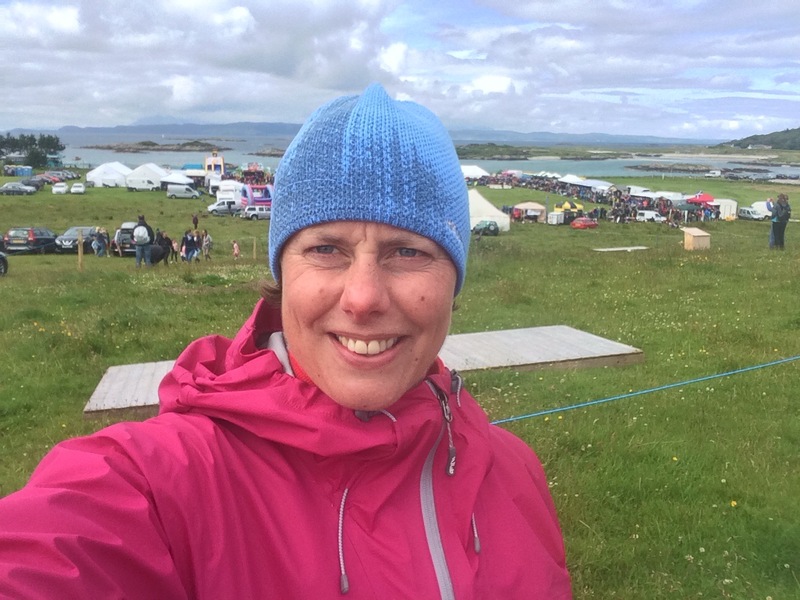 It is quite a dramatic coastline with some good cliffs and great views, particularly to Mull’s own set of small islands: Ulva, Gometra, the Treshnish Isles, Little Colonsay and Staffa. Unfortunately today was not a good day for views. 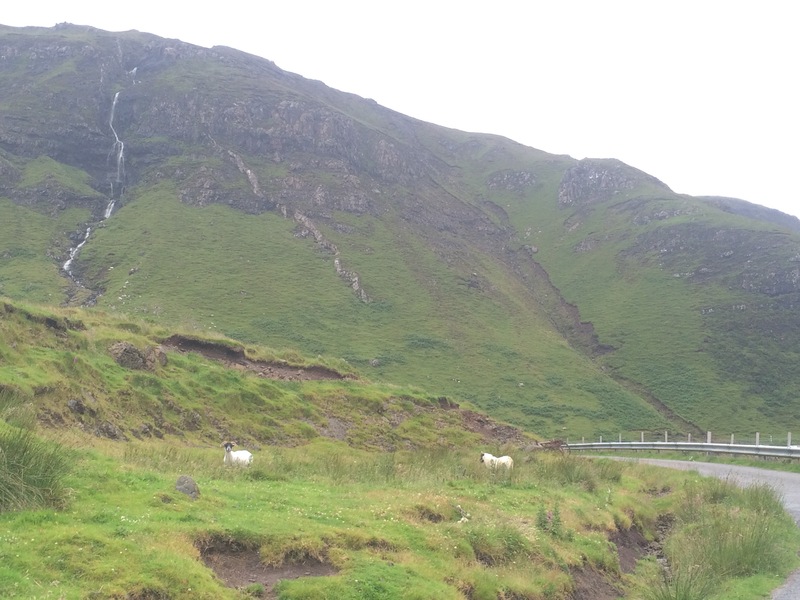 I enjoyed the drive nonetheless and did see a rather angry looking waterfall that was quite impressive. 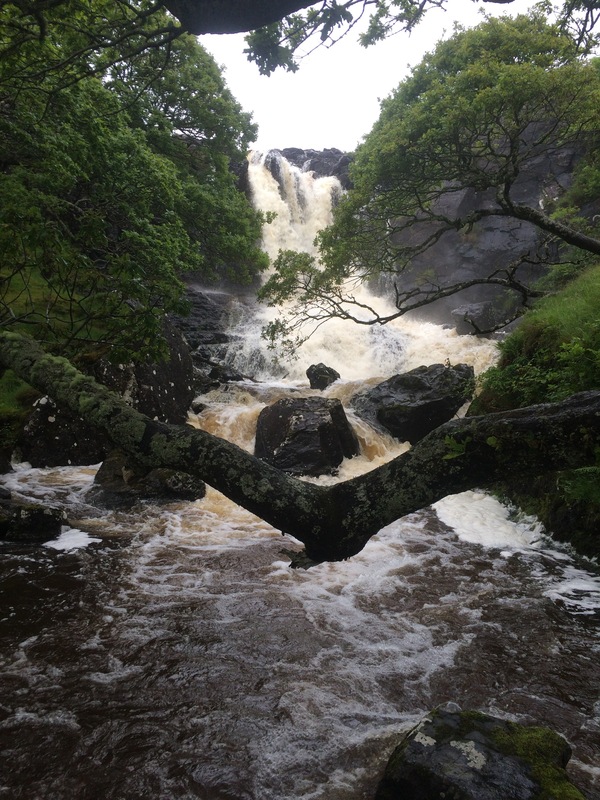 I think all this rain has swelled the waterfall! I also stopped at Calgary Beach, with its beautiful sand and clear sea. Back in Tobermory I checked into the Youth Hostel on the High Street and went to the pub along the road. Just my luck they were short on chefs tonight so were no longer serving food when I went to order. A quick trip to Co-op and it was a pasta meal for me. Today was predicted to be the nicest day of the week and I had a long drive ahead of me, hopefully with some good views. 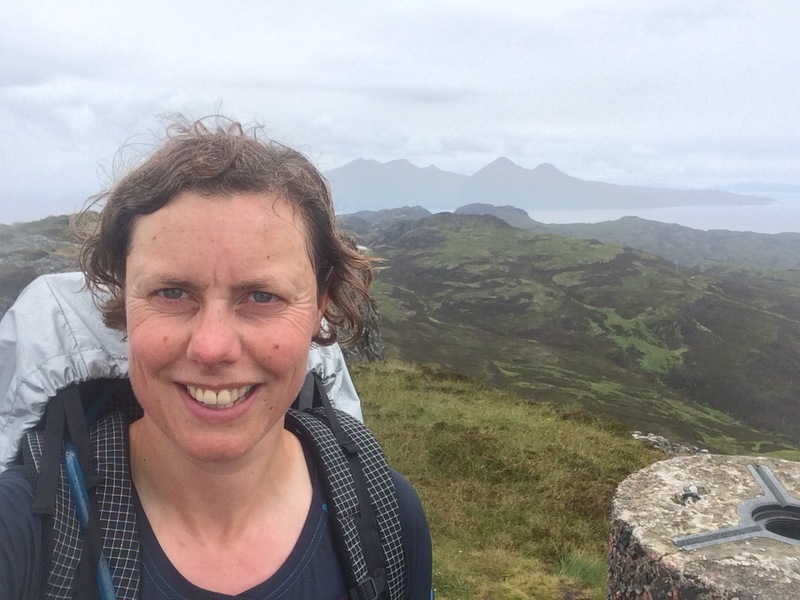 First stop was the Prince’s Cairn at the head of Loch Nan Uamh. 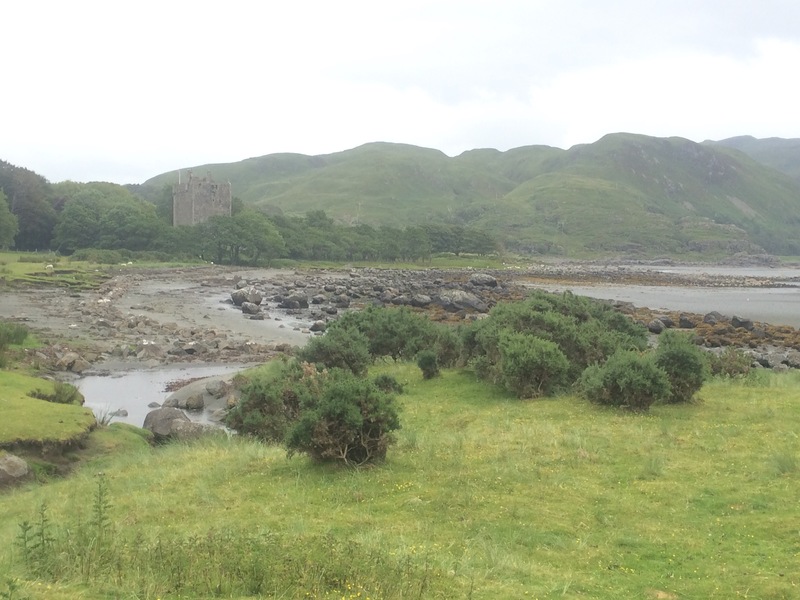 This was where Bonny Prince Charlie landed in Scotland, and from where he made his escape on a French ship. 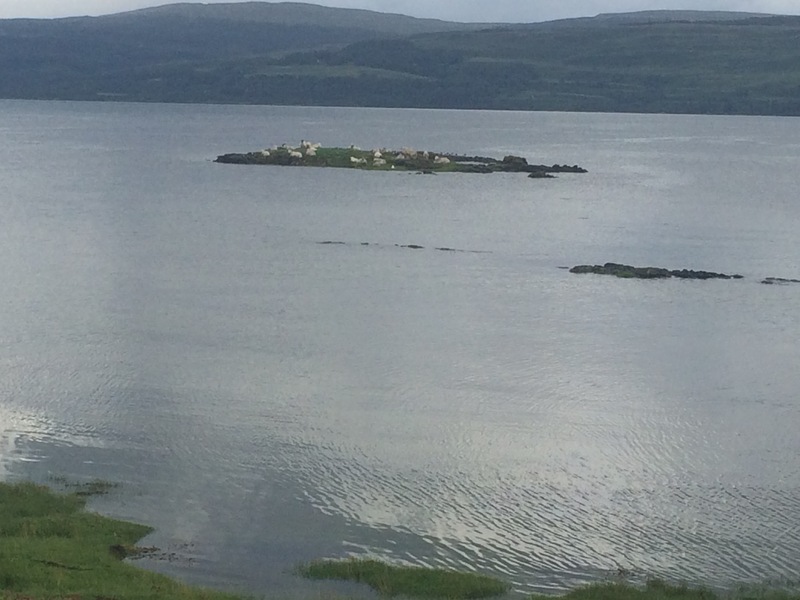 Clan Ranald had supported him and there is reputedly still some buried gold in the area, treasure rescued from the battle between the English and French ships (the French were sided with the Scottish Stuarts). 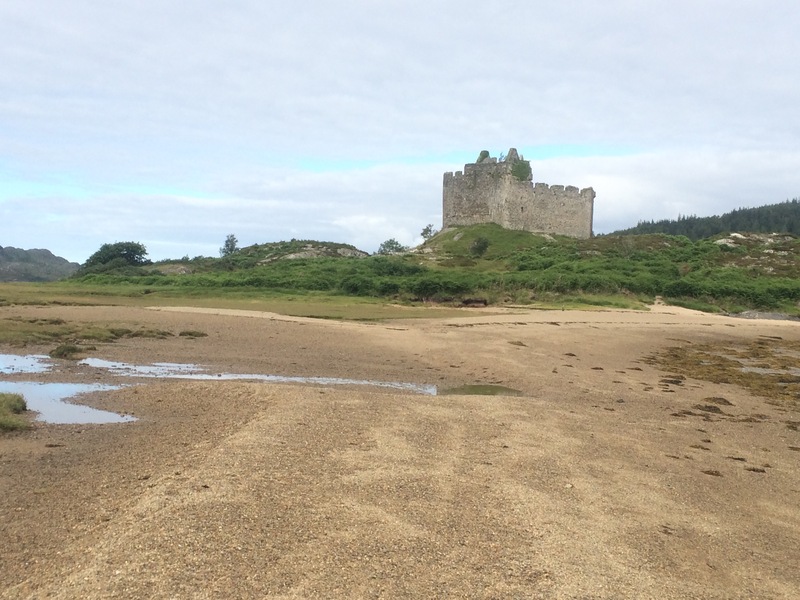 I took a slight detour to see Castle Tioram on the edge of Loch Moidart. 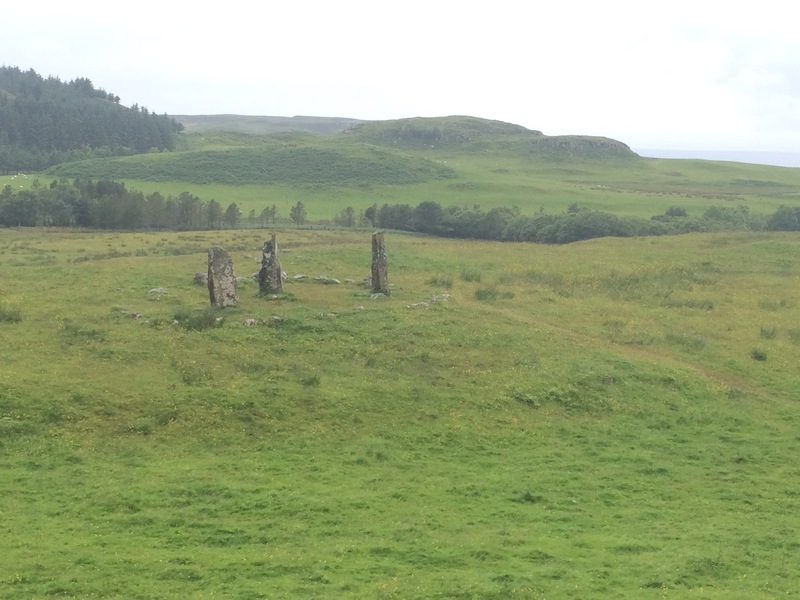 This was once the main residence of the Clan Ranald Macdonalds. 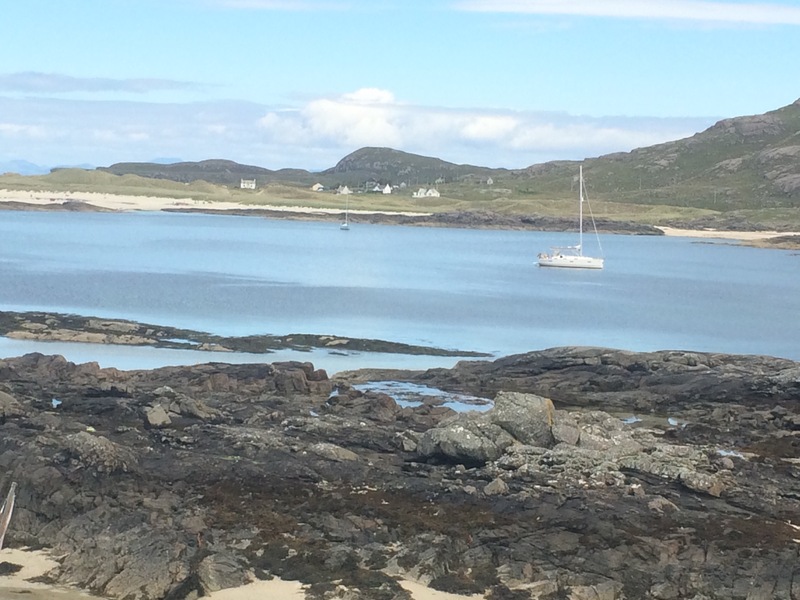 It is perched on a rock that can be reached across the sandy beach at low tide, facing the North and Aouth channels of Loch Moidart as they envelope Eilean Shona. 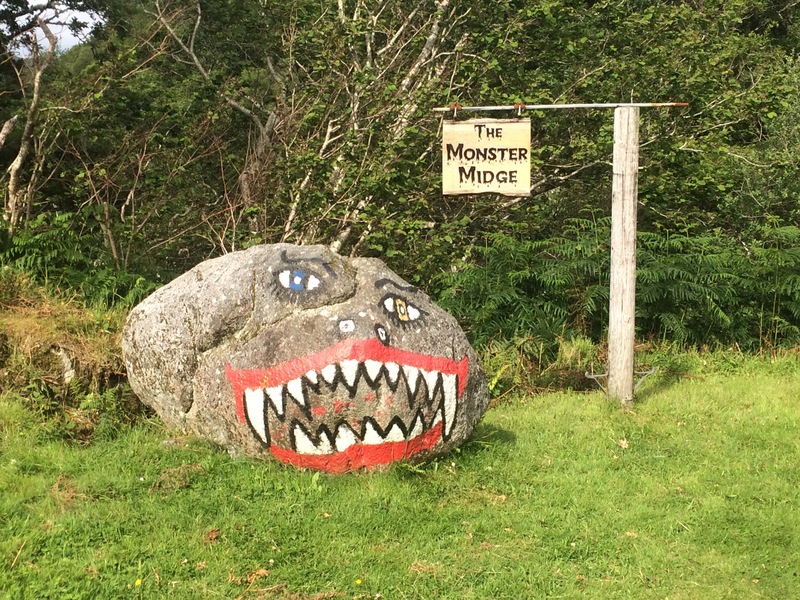 I drove through the village of Acharacle, which seemed to be right in the heart of holiday home country. There looked to be some good fishing rivers around here and Possibly some hunting as I saw a few deer antlers hung up on houses. I stopped at the tea room; one of the nicest tea rooms I’d been in. Like others in these small places it was a community-run facility and attached to the only shop-come-post office in the village. 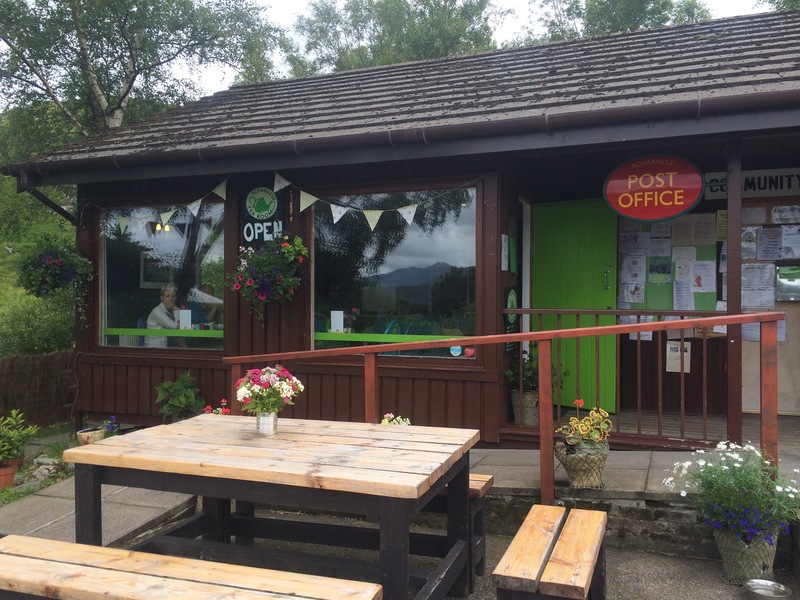 It does seem like the most enterprising villages set up tea rooms and the like (sometimes in their village halls) to take advantage of the passing tourist trade. It’s a great idea and provides me with much needed(?) coffee and cake. 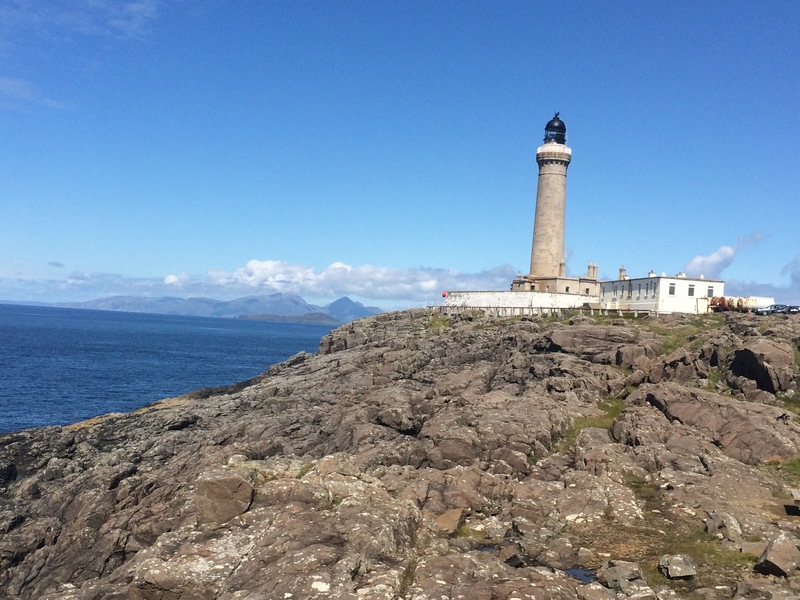 The Point of Ardnamurchan is the most Westerly point of the UK mainland (27 miles further West than Land’s End) and today was a great day to visit. 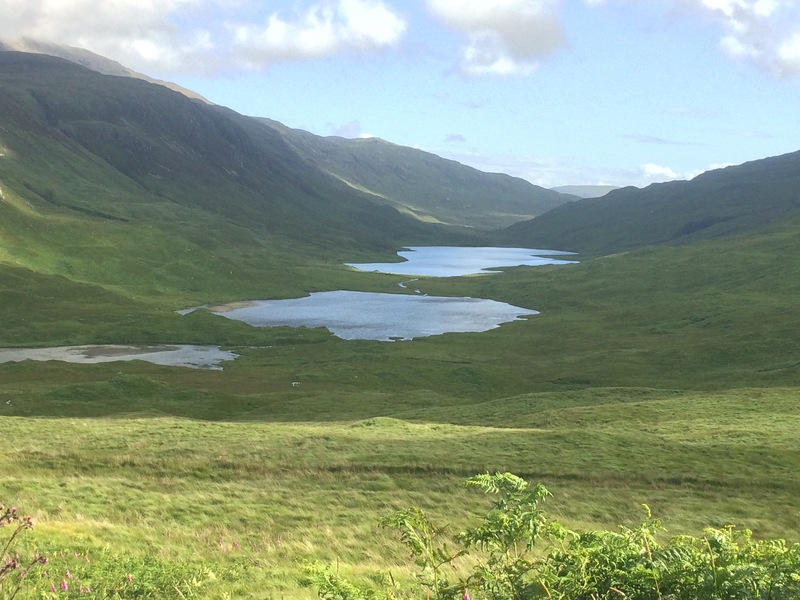 It is a long drive across the Ardnamurchan peninsula, which was once a volcano. Aerial photos show clear circles in the landscape and it is possible to see cone sheets caused by volcanic activity around Ben Hiant. Apparently these are world famous. They do look quite impressive. Whilst waiting at some traffic lights just before the lighthouse (only set of traffic lights I’ve seen on these single track roads) I was able to watch some Red Deer munching the grass. They were not bothered by me in the slightest. I arrived at the Point just as the clouds parted and the sky became blue. Perfect timing for a trip to the top of the lighthouse to admire the amazing view. The old lighthouse keeper (he was on the keeper list before the lighthouse was automated in 1988) showed me around and loaned me his expensive binoculars. 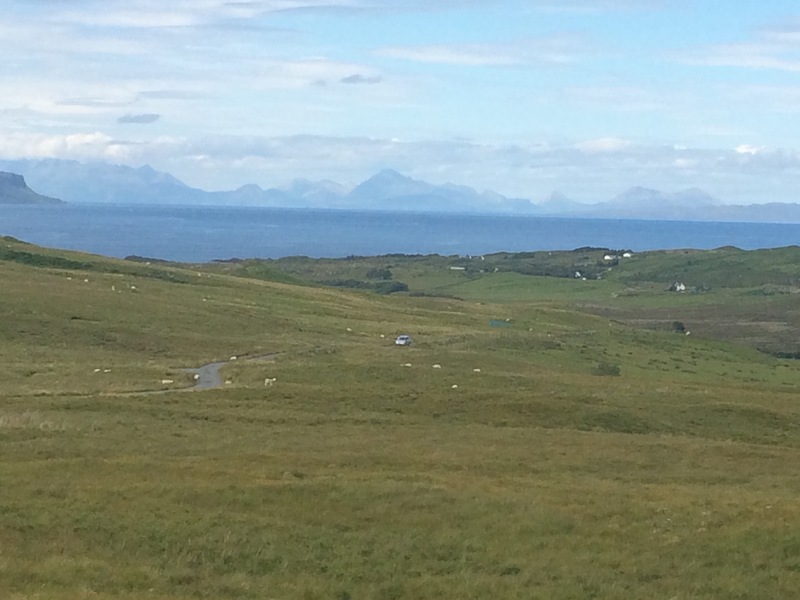 I could see the Small Isles, the tips of the Cuillins on Skye and out as far as Barra and South Uist of the Outer Hebrides. There were several yachts in the sea as this seems to be a good place for sailing. 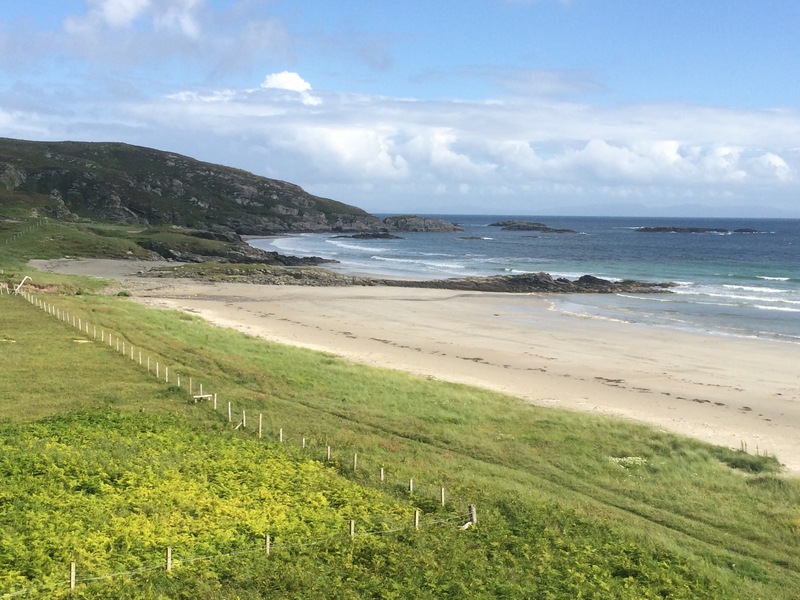 I could also see a couple of Ardnamurchan beaches, including Sanna. 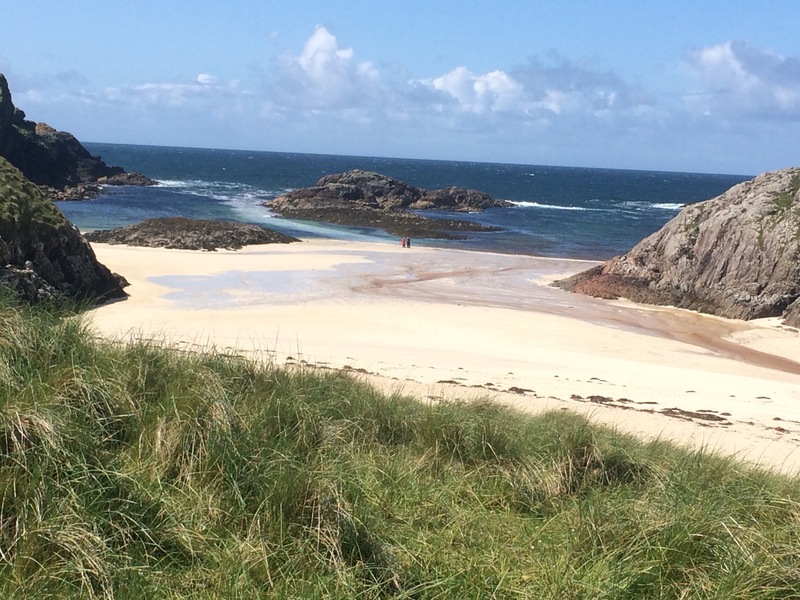 Similar to Arisaig, the sand was white and there were lots of small rocks just off shore that become islands at high tide, but these beaches were bigger and more difficult to get to so would be less crowded. Apparently there were lots of basking sharks right here by the rocks last year, but none so far this year. 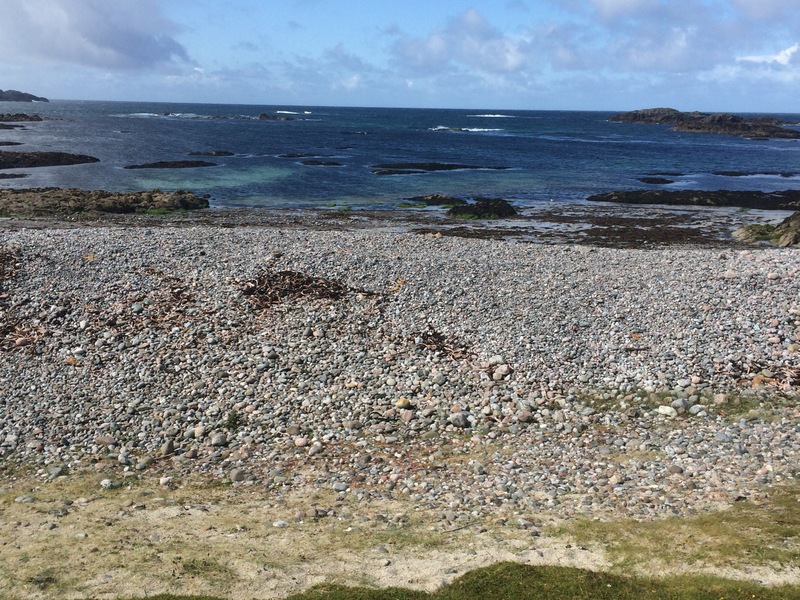 The beach at Sanna Bay had looked so nice that I drove around to Portuairk to admire the white sand and the lovely colour of the sea. I keep seeing so many kayaks around here – this seems to be a great coastline for sea kayaking. The drive back along the side of Loch Sunart was beautiful. I stopped briefly at Strontian (the town after which the element Strontium is named!) to get some fuel and then headed South across Morvern to the Sound of Mull. The clouds were closing in and I was glad I’d booked into a hostel for the night as the forecast was for very heavy rain. 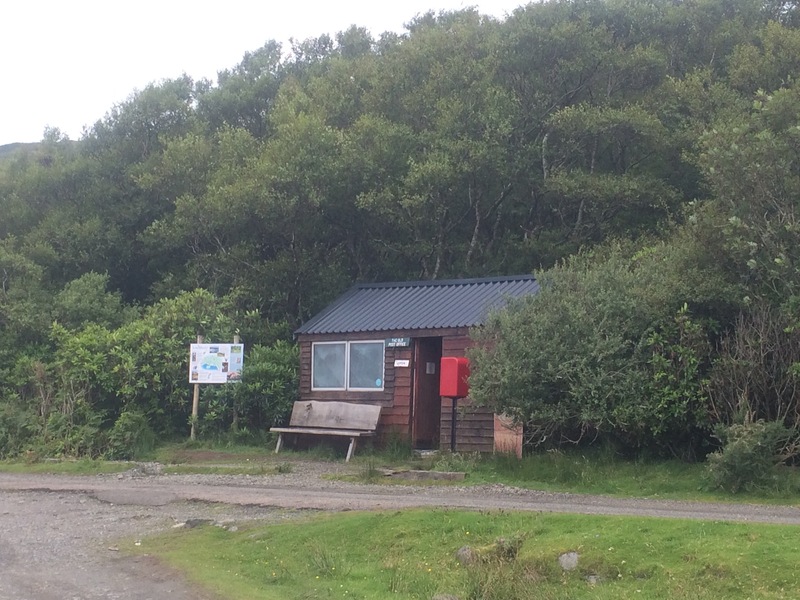 Lochaline Dive Centre was a very relaxed place – I didn’t even see the owners. I was too late for the shop, where I could have got food and tokens for the launderette. Instead it was toast and handwashing for me. Still, I had a bed for the night and was out of the rain. The rain eased off during the night and the order of the day was wind instead (and a bit of rain but also a bit of sun). 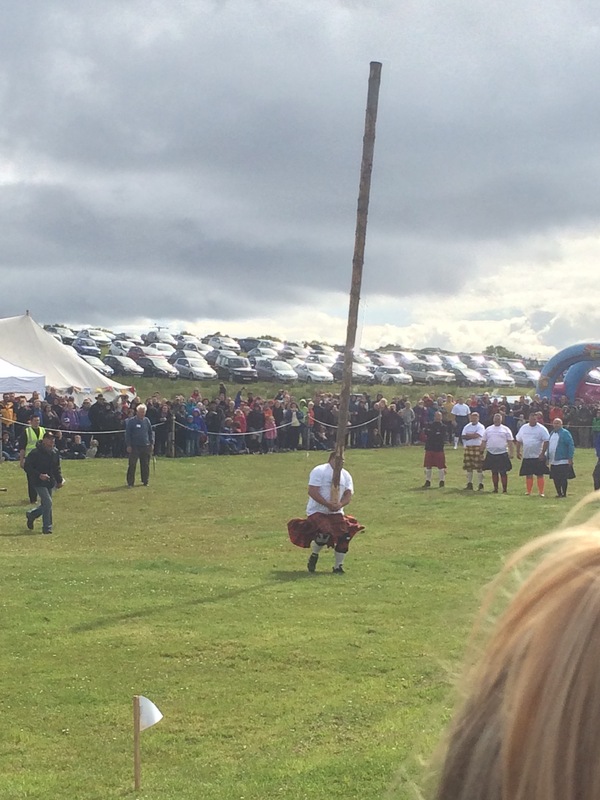 I couldn’t miss out on the opportunity of attending a Highland Games whilst up here and this one was right opposite my campsite. There was a big arena with a ‘running track’ marked with flags placed in a circle and a wooden stage in the corner. 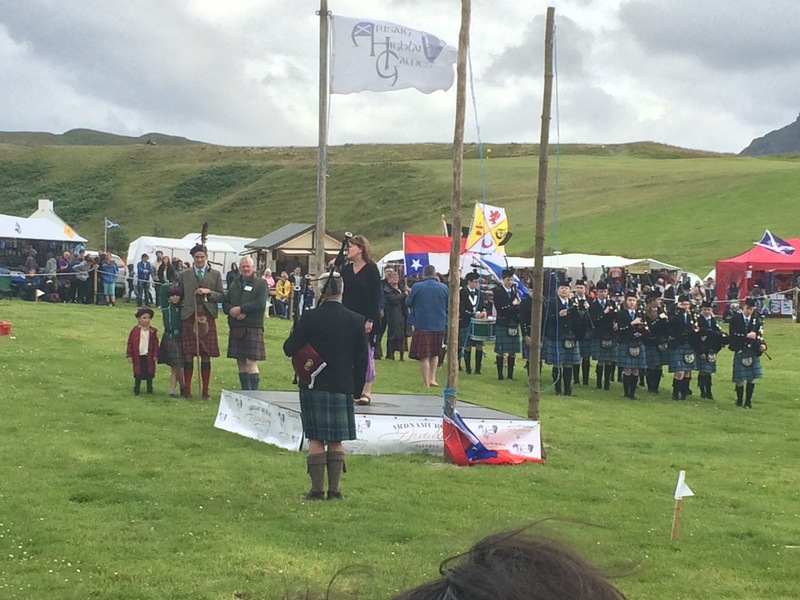 A pipe band led a the Clan Ranald representatives onto the field and the Clan Ranald chief made a speech (he sang a Gaelic song) to open the Games. There was plenty going on. 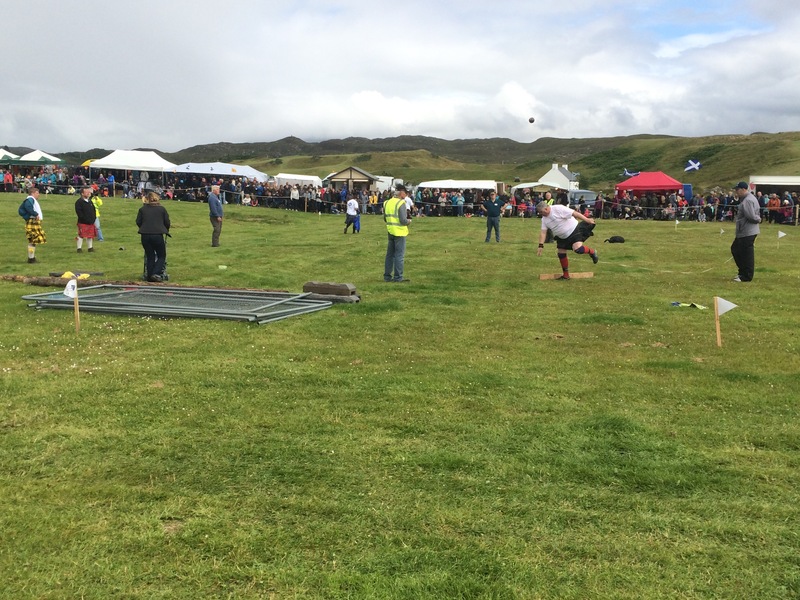 The ‘Heavies’ competition (big men throwing all different weights and tossing the caber) went on all afternoon in the middle of the arena with other competitions going on around it. 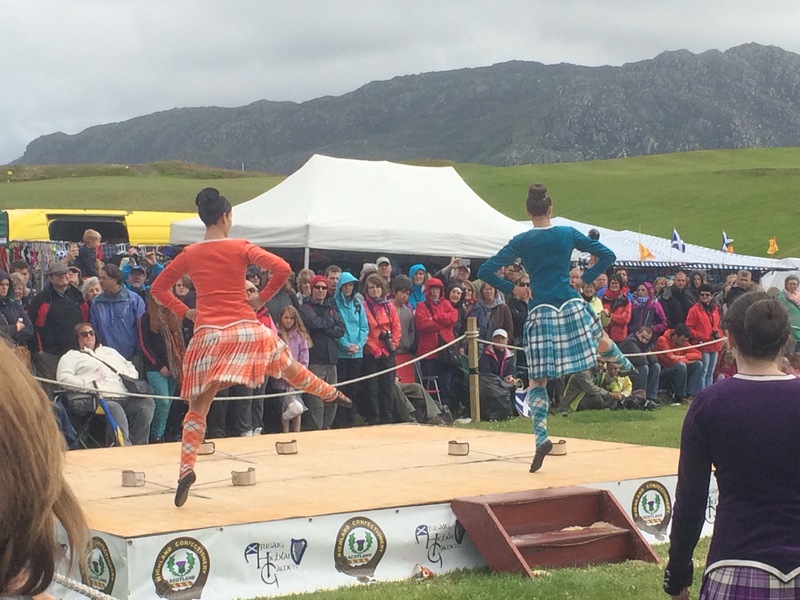 I saw highland dancing, bagpiping, running races, high jump and long jump. 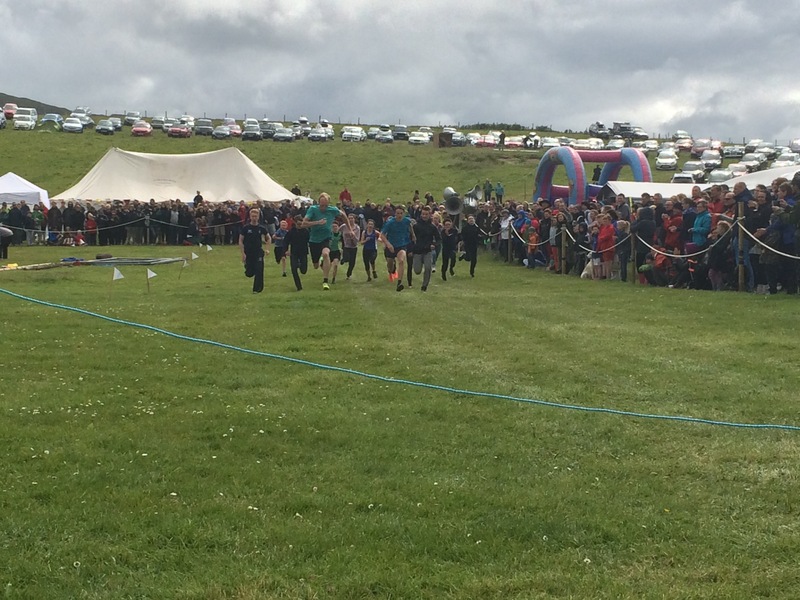 It was all good fun and there was prize money on offer (£100 for winning a bagpiping competition, £10 for a highland dancing event). 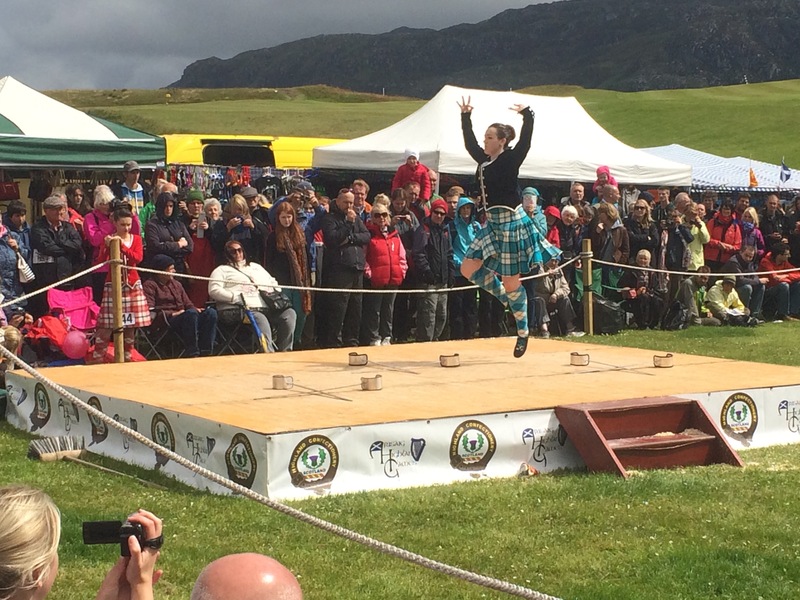 People had come from far and wide to watch, and indeed to take part – an Aussie lady won all the highland dancing trophies and a Canadian was competing in the Heavies. Most of the running races were open events that anyone could enter but unfortunately I had left my trainers at home. 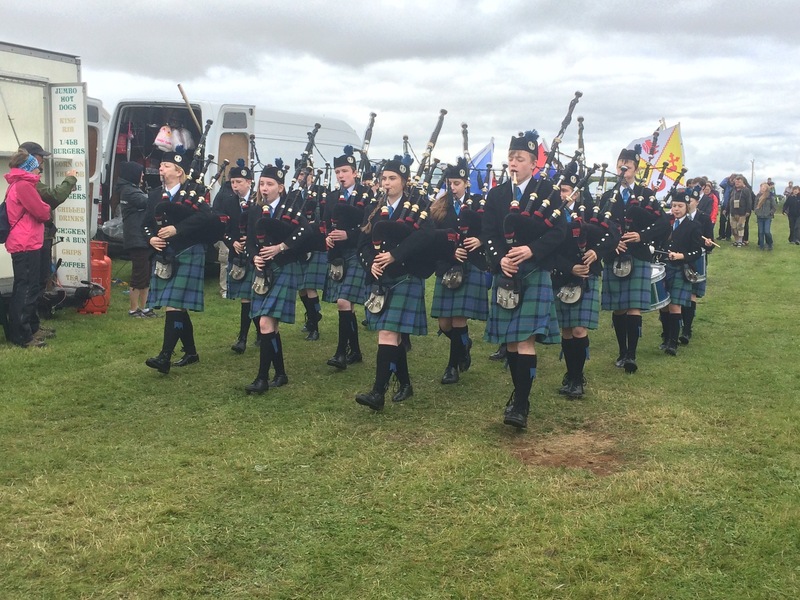 The bagpiping competition apparently was a very high standard and had 3 professional pipers in it. 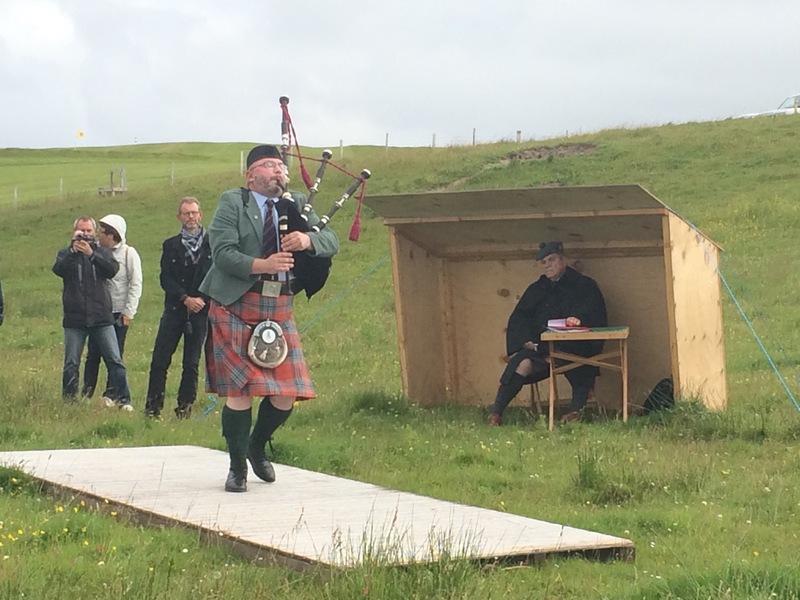 I was told the man who won is considered to be one of the top pipers in the world. I was supporting the young guy from Hong Kong who was representing the RAF (I have no idea how this came about as he wasn’t very talkative). Andrew representing the RAF – stunning backdrop! 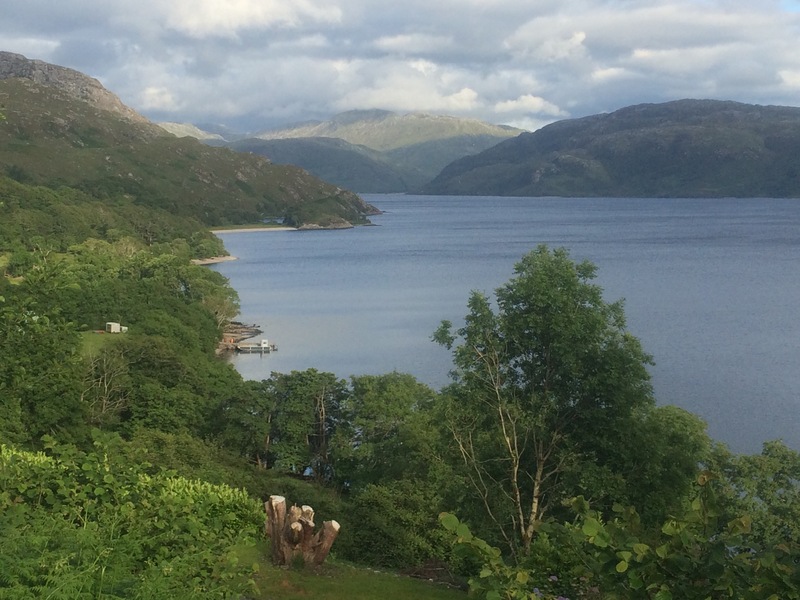 In the evening I drove along Loch Morar, just inland of Mallaig, as it was quite a nice evening. Such a beautiful, peaceful loch. It rained all night and persistently all day as well. When I got up I discovered my tent was now surrounded by puddles and bog, which wasn’t a great sign but I just left it and hoped it would survive. 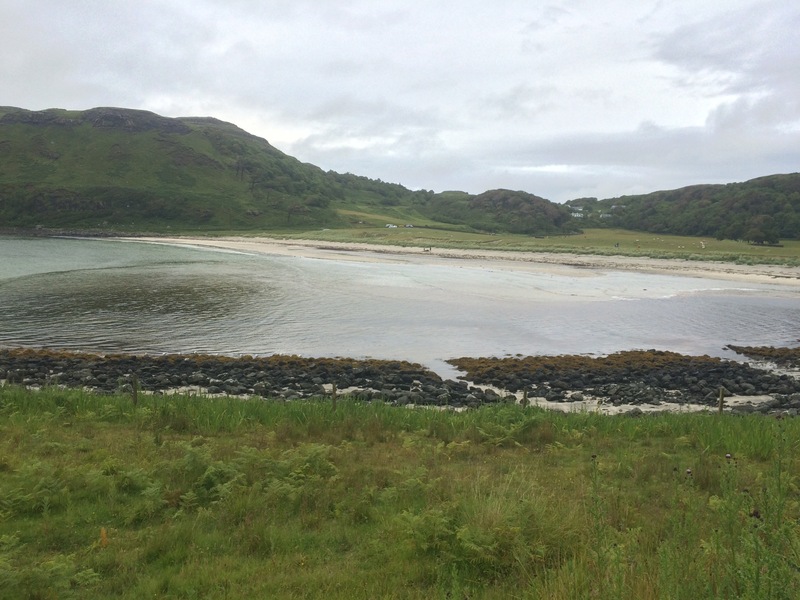 I drove back to Mallaig just for the hell of the twisty, turny drive and the views of small white beaches. I parked up by the port and made some cheese and tomato sandwiches with the rest of yesterday’s provisions. A fine breakfast, and washed down with a coffee. 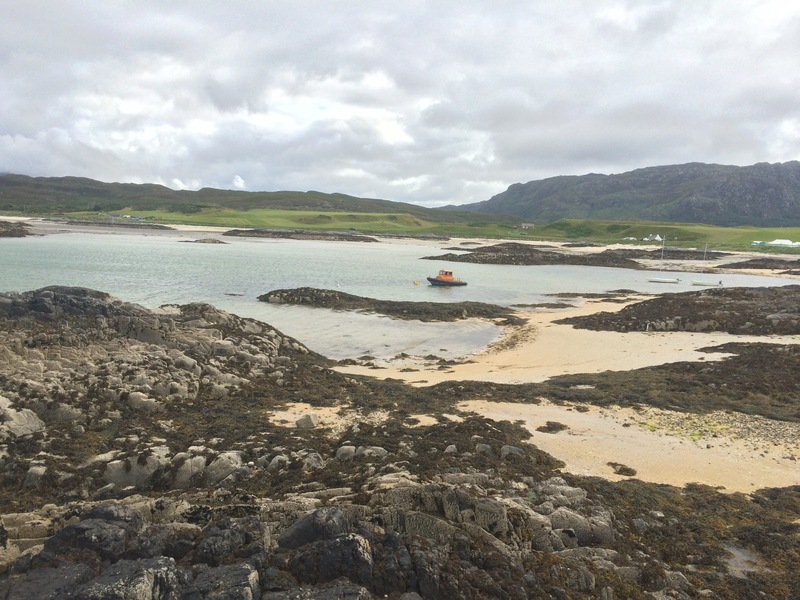 I spent some time trying to plan and then drove back to Arisaig to catch the 11 am ferry to Eigg. 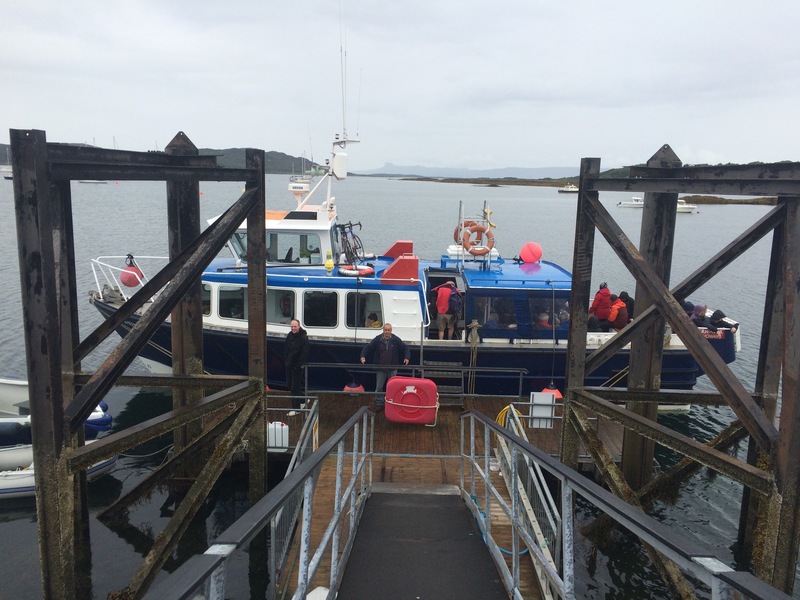 The campsite manager had recommended the Arisaig ferry rather than the Calmac ferry from Mallaig as “if they see wildlife they divert to go and look at it”. That sounded like the ferry for me. 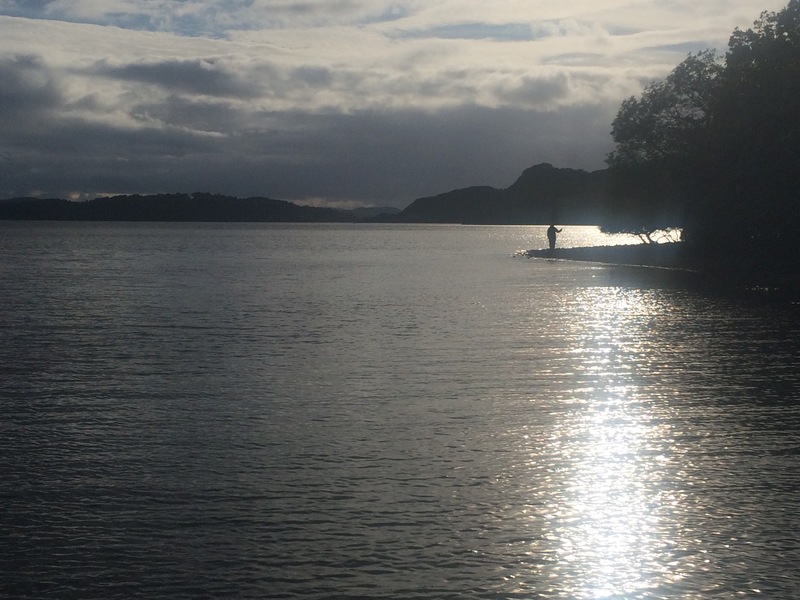 There were lots of sea kayakers already out paddling in Loch nan Ceal and the Sound of Sleat. We were about halfway across the Sound when someone yelled “whale” and everyone on board scrambled for a view. The boat driver idled the engine and we looked, and looked, and eventually it popped up for a breath. On the 3rd time I finally saw it (it didn’t move in a straight line and we weren’t steady either so you had to be in the right place on the boat and looking in the right direction to get a view). I saw it 3 times and the driver chased it for a bit. 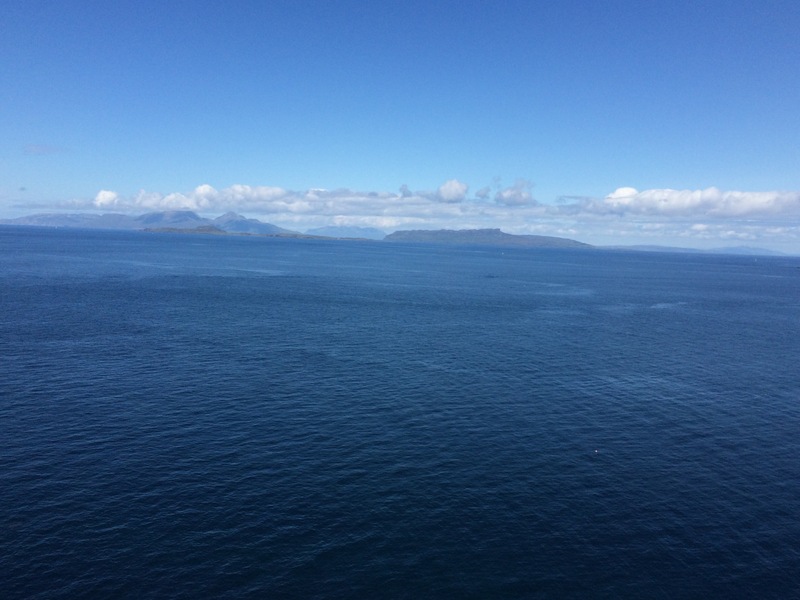 It was one, or maybe two (the fins looked different) Minke Whales. Fantastic. I also saw a couple of Dolphins that were playing with some sea kayakers, but they were in the distance. 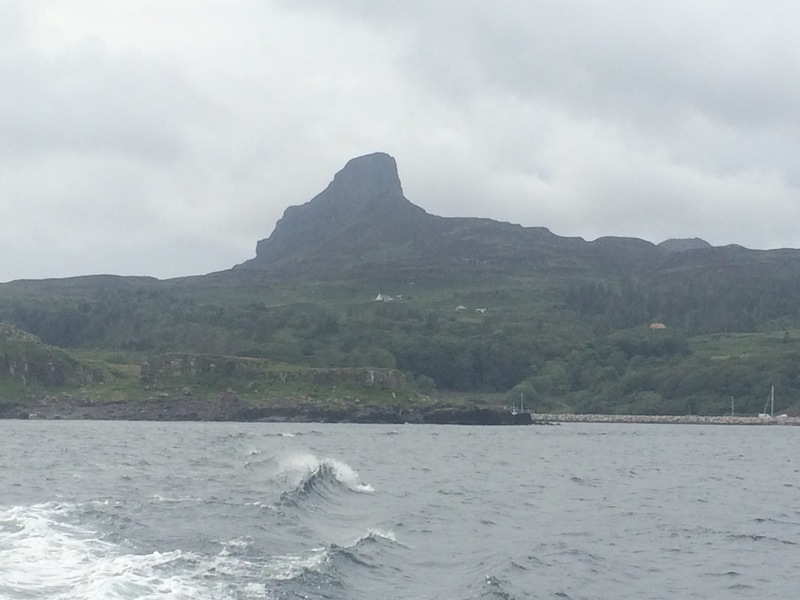 We were 15 minutes late landing at Eigg but no one cared. 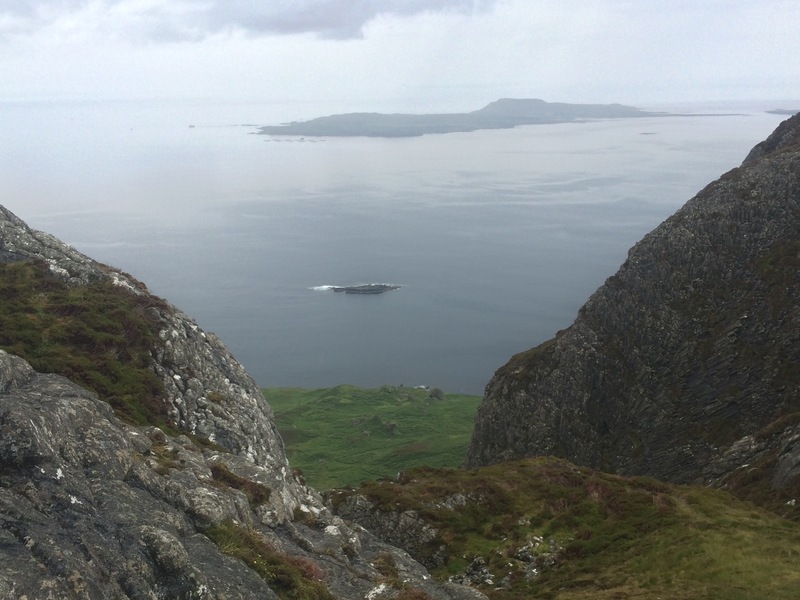 It’s a small island that I don’t have a map for nor had I done any research about it so I decided to walk up An Sgurr, the big ‘cliff’ that dominates the island. I bought a postcard with a rubbish map on it just in case, even though it was useless, because I felt naked without a map. It took me just over an hour to negotiate the mud and the bog to the top. 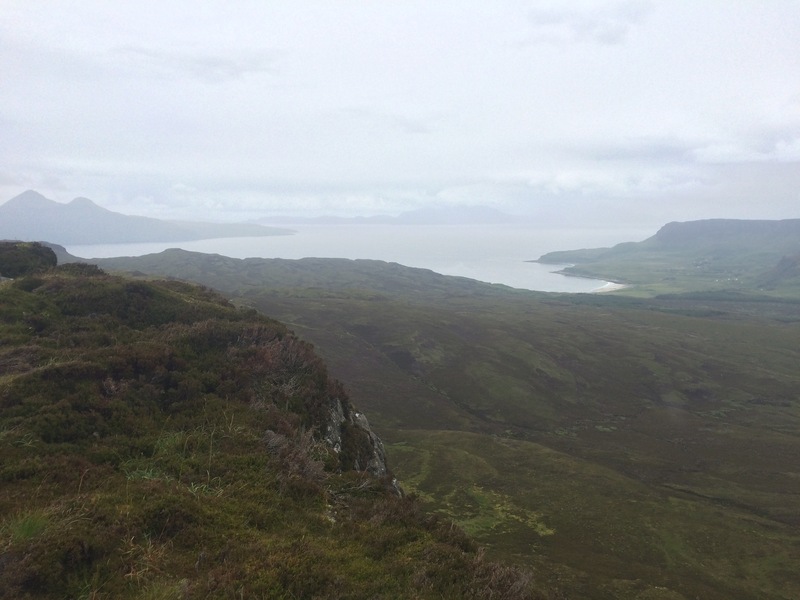 It was worth it for the amazing views…not today! It was still raining and everything was shades of grey. I could see the closer islands and vaguely make out the mainland in the distance but that was it. At least the walk was enjoyable; I like going up hills. The way down seemed trickier as the rain was coming down harder and the rocks were slippy. Time for a mug of tea and a cake in the tea room. I braved the weather again to wander around the beach, whereupon I was dive bombed by some terns. The wind had picked up for the ferry back and so it was a case of hunkering down out of the spray. A few birds but no cetaceans to be seen. Looking back at An Sgurr, the sea was a bit choppy! I drove into Mallaig again in the hope of getting some wifi but didn’t succeed. 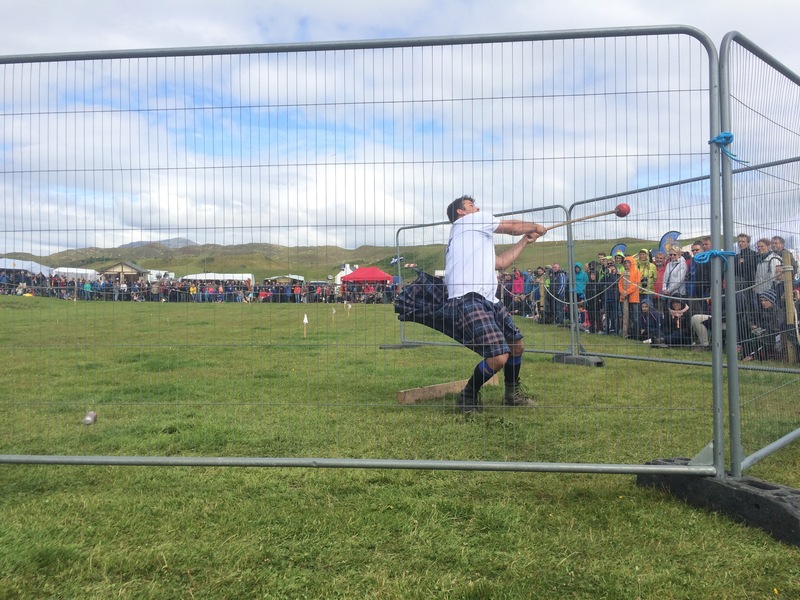 I headed back to the campsite, checked my tent wasn’t flooded, and popped across the road to the field where the Highland Games will be taking place tomorrow. 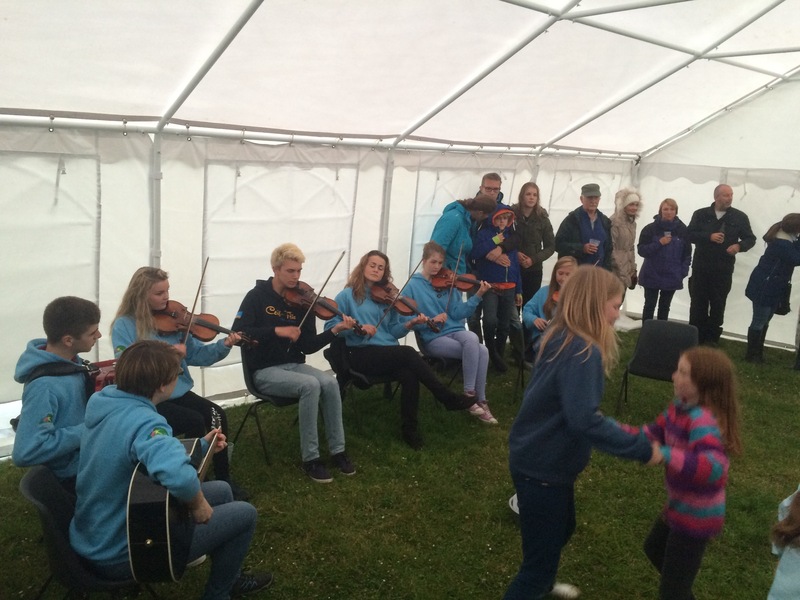 There was a beer tent and some live ceilidh music so I hung around for a bit. It was freezing cold and I was wearing all of my top layers (but still wearing my shorts). It rained all night and was still raining in the morning, with no sign of a let up. 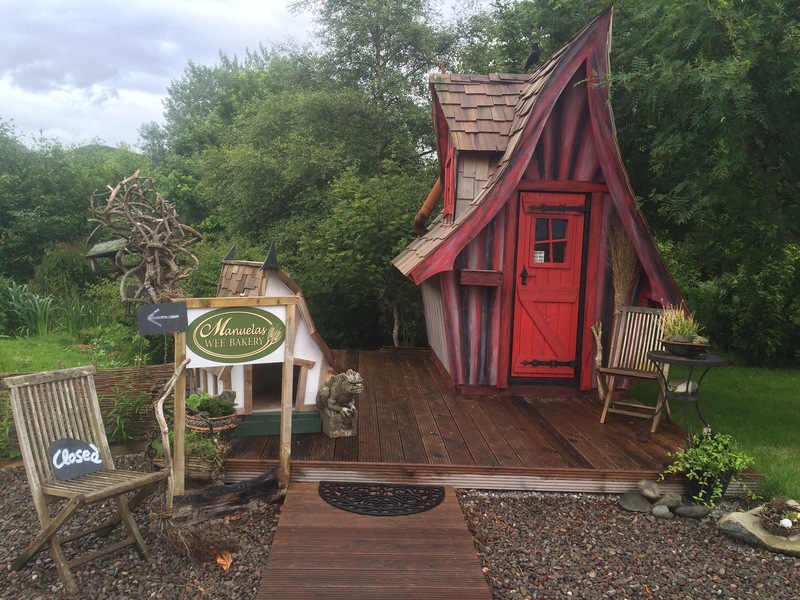 I packed away and went across the road to Manuela’s Wee Bakery, a random shop in this tiny village that’s not even a through route to anywhere. 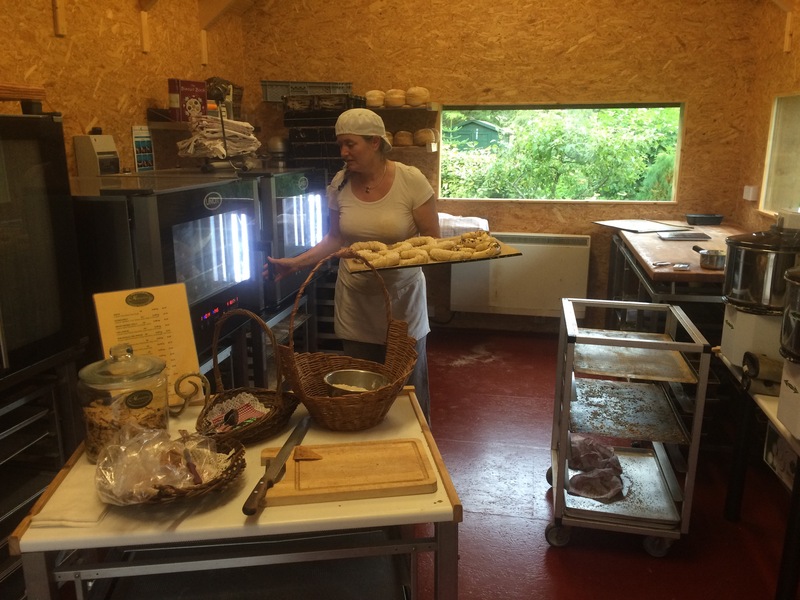 What a great place; run by a German couple who have built a bread oven and make great bread. I bought 2 (German style) chocolate croissants for breakfast and a multi seed heavy load. Good job I’m not walking as I don’t think I could manage the extra weight! 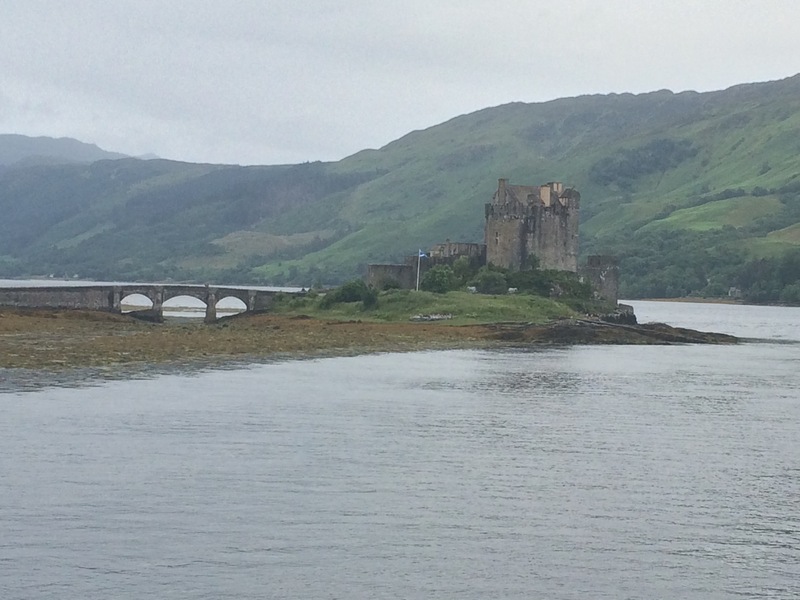 I stopped to admire Eilean Donan Castle, which is handily placed where 3 lochs (Alsh, Long and Duich) meet. I didn’t pay to go in as something told me it wouldn’t be worth the price. It is spectacular looking on a small island, surrounded by mountains. 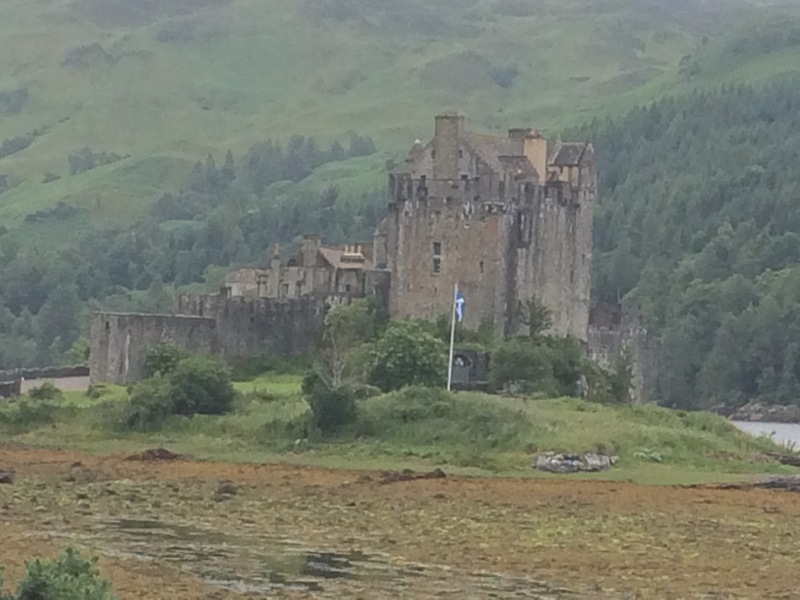 It was built in 1214 by the Mackenzies, destroyed in the Jacobite Rebellion, and rebuilt in the early 1900s. By 9.30 the car park was full and there were 4 coaches. Time to leave. Today’s drive was long but through the heart of the mountains taking in Glenshiel and part of the Great Glen along the way, as well as a few lochs. 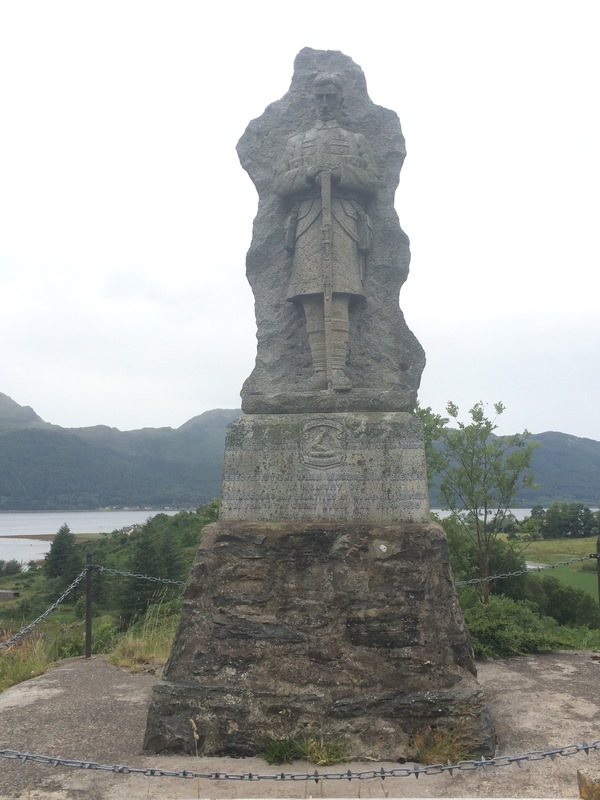 The theme today was the Jacobite Rebellion of 1745 and it was a tour of various monuments, starting with the Macrae War Memorial on a small hillock looking down Strath Croe. 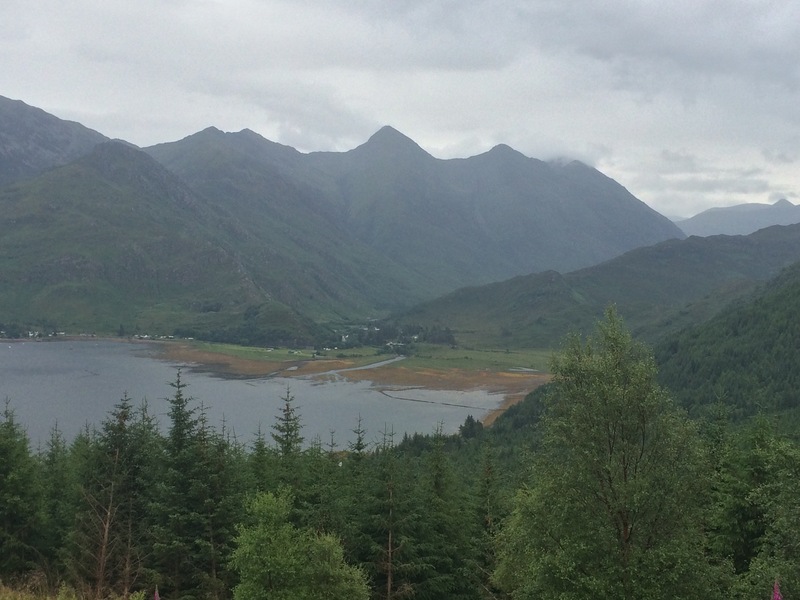 I drove past the 5 sisters of Kintail and craned my neck to see the tops through the windscreen and the cloud. 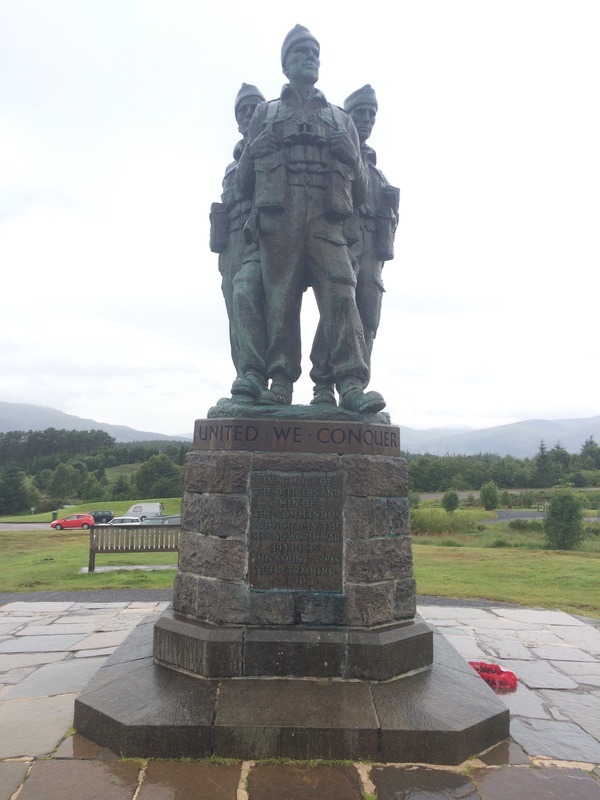 Just before Fort William is Spean Bridge and by the roadside, with great views, is the Commando Memorial. 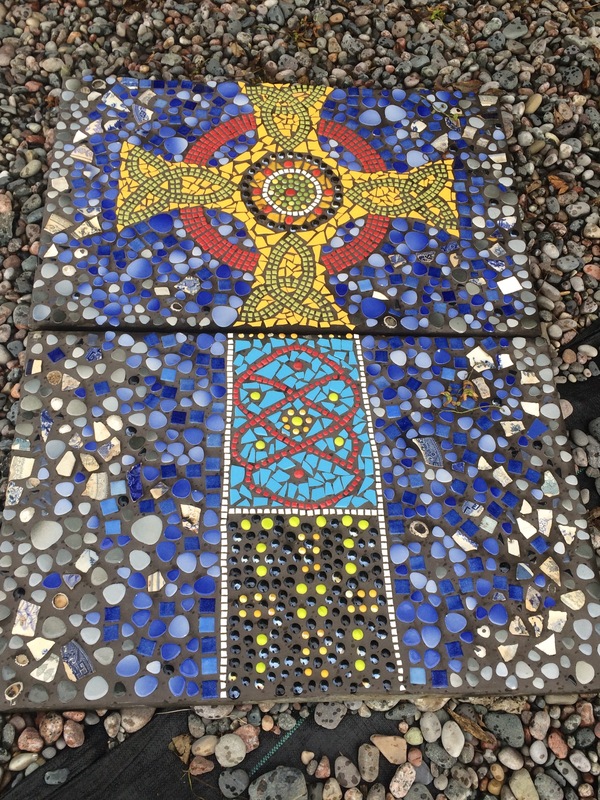 Not just a memorial, there is an area of remembrance and an area for the scattering of ashes. A proper band of brothers. 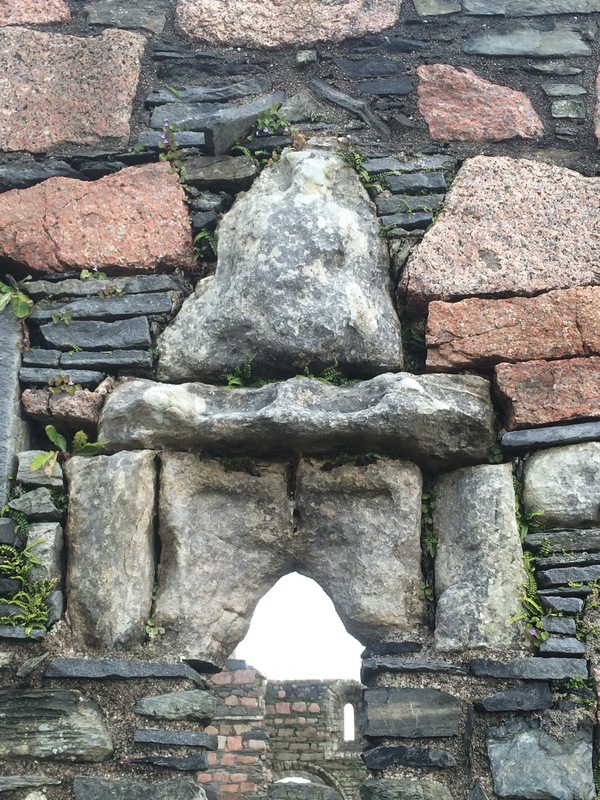 I wasn’t overly impressed by Fort William; I expected a bit more from the outdoor pursuit capital of Scotland. I spent an hour or so in the West Highland Museum mainly learning about the Jacobite Rebellion, the last attempt to put the Stuarts back on the British throne. Bonny Prince Charlie’s army was finally defeated at the Battle of Culloden in 1746 (the battle that let to the building of Fort George near Inverness). 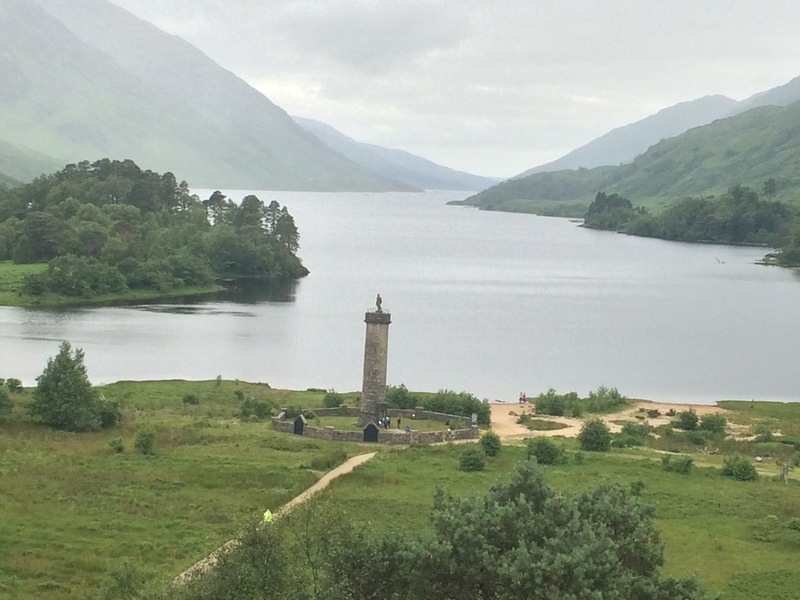 My final memorial for today was the Glenfinnan Monument prominently posed at the end of Loch Shiel. It was erected in 1815 to mark the place where Bonny Prince Charlie supposedly raised his Royal Standard to begin the Jacobite uprising in 1745. 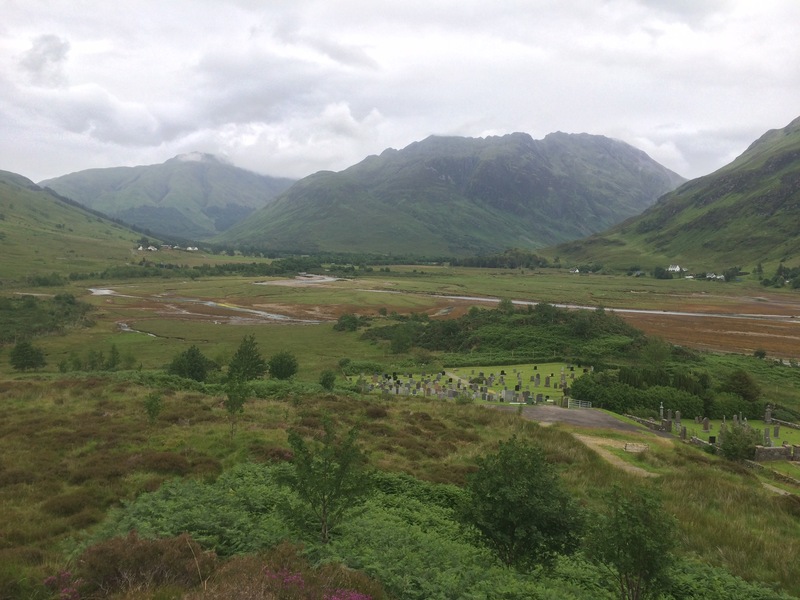 From the viewpoint one can also get a good view, in the other direction, of the Glenfinnan Viaduct. 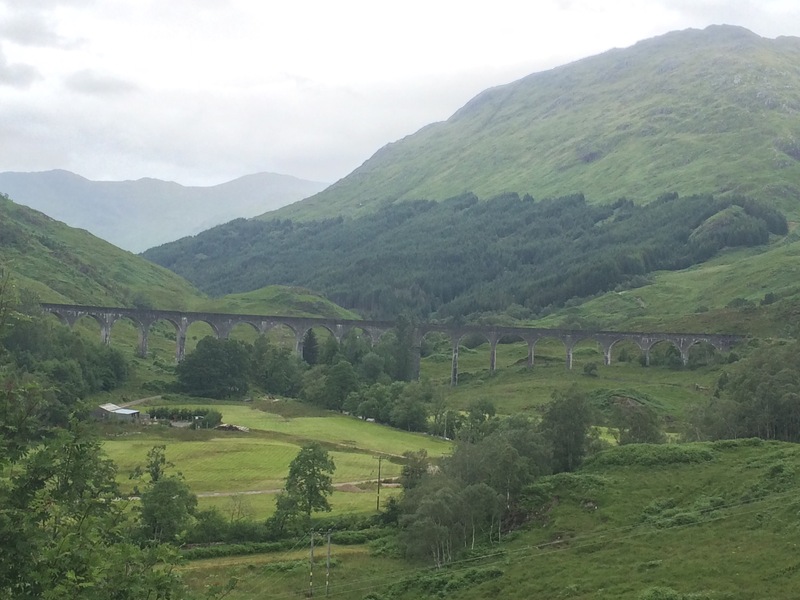 This magnificent structure carries the railway line from Fort William to Mallaig and was apparently featured in the Harry Potter films. 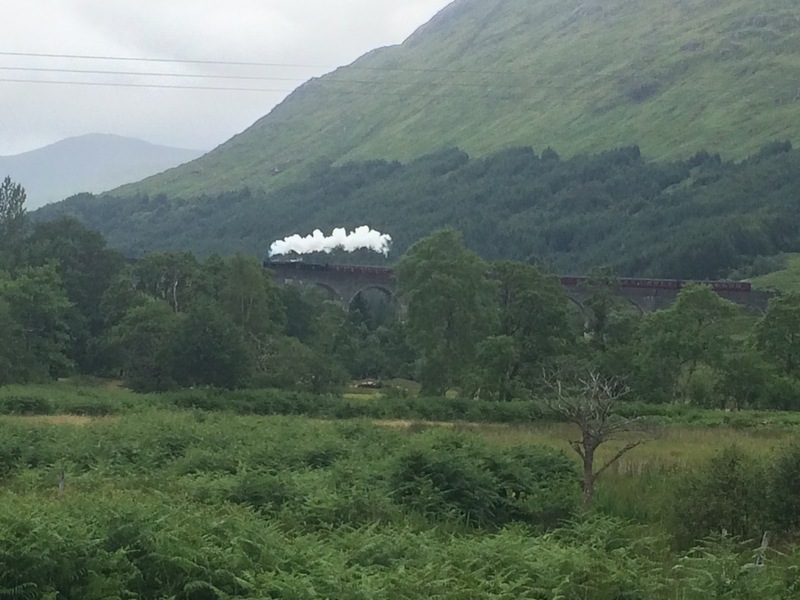 I was there at just the right time to watch the twice daily steam train pass over it. Lots of people had clearly made a point of coming to see the train go over the viaduct; I assume several were Harry Potter fans. Is Harry Potter on that train? 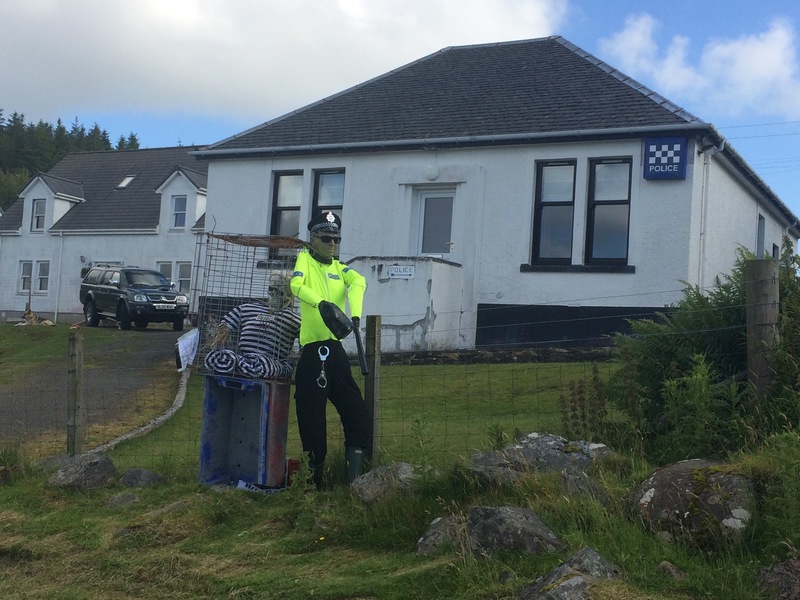 It was late afternoon when I arrived at Arisaig and stopped at the information centre. I learnt that Arisaig was the centre for SOE training during WW2. Seemingly its location, being difficult to get to across the ‘rough bounds’, made it ideal for secret training. Plus there were enough large houses that could be requisitioned. 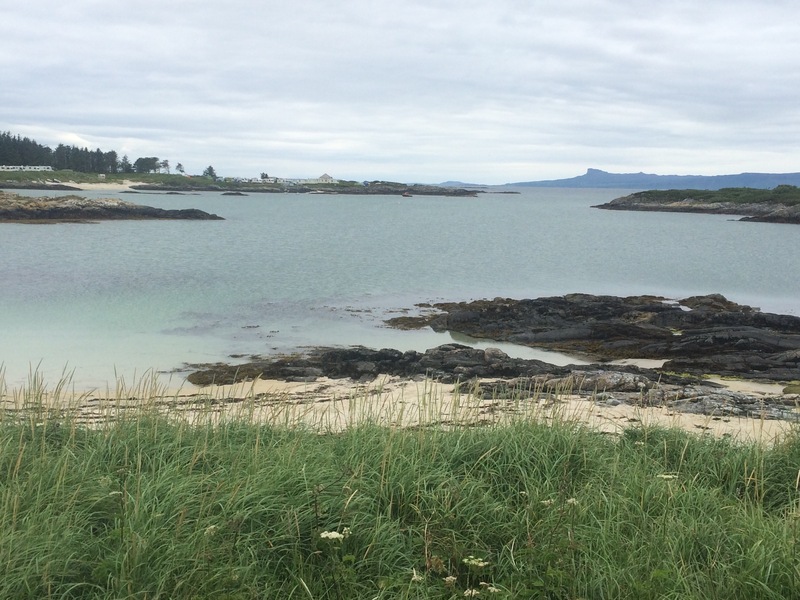 The Arisaig coastline is stunning. Completely different to all the other places I’ve seen, with lots of rocks offshore that look like tiny islands. At low tide they are mostly all accessible across the sand. And what a colour the sand is! The whitest sand I’ve seen in the UK, nowhere else have I seen the same colour sand. Shetland came closest. 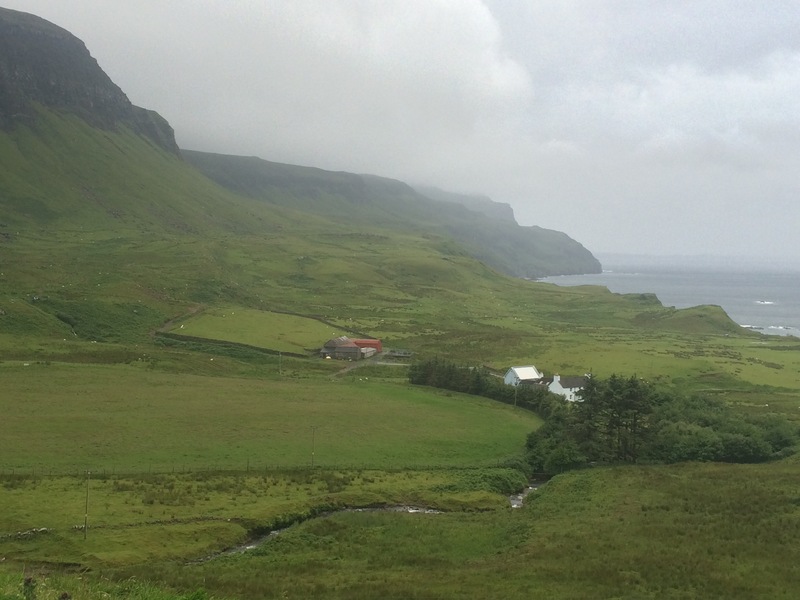 The views were too many and too varied to do it justice with a photo. 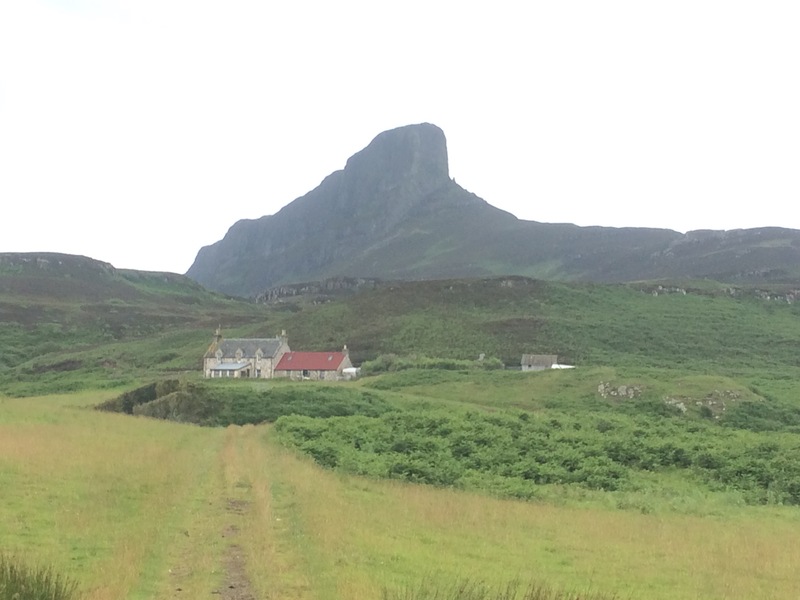 It is opposite the Small Isles of the Inner Hebrides: Eigg, Rum and Muck. Yet again I was wowed. There are about 6 campsites here, right on the coast, and I only found one with space for my small tent. 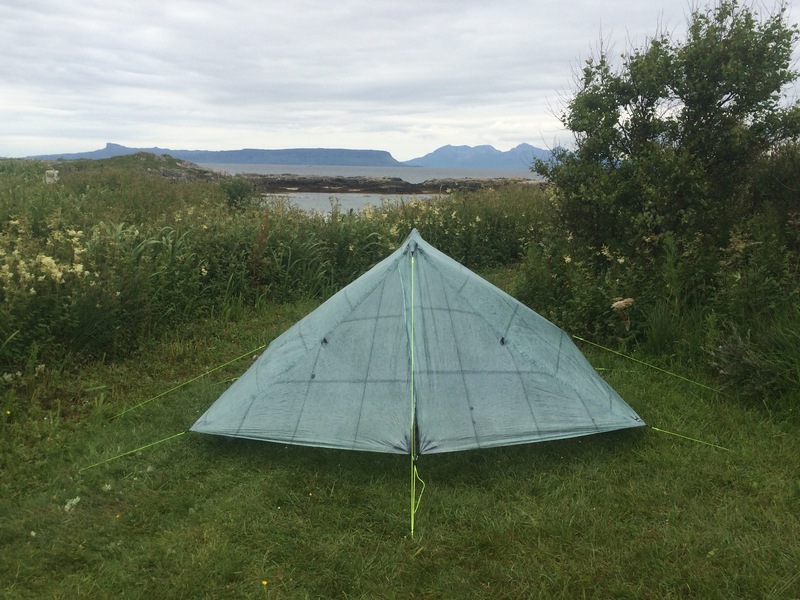 Fortunately it was just fine as I would rather have facilities than wild camp, although I saw several tents pitched along the coast in all sorts of places. 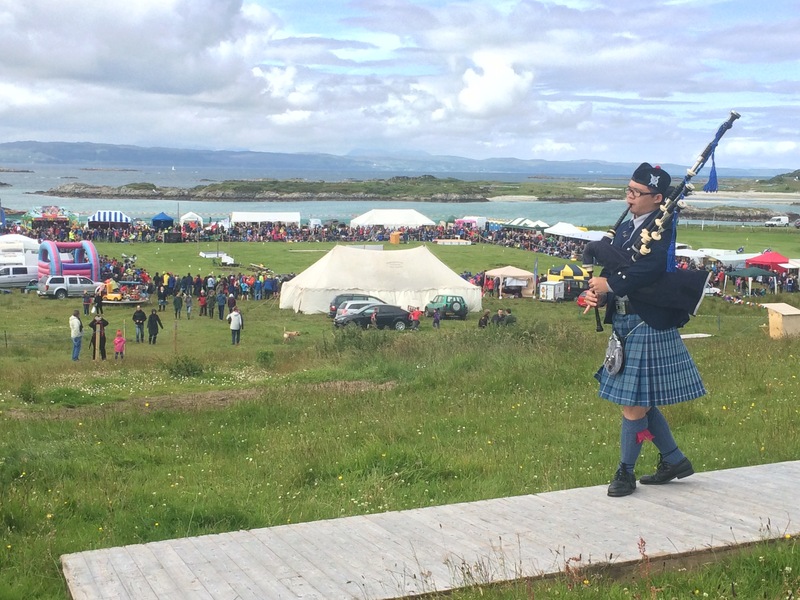 Arisaig was gearing up for its Highland Games on Wednesday so on the spur of the moment I thought I’d stay here to watch them and take a trip to the Small Isles tomorrow. It will be nice to stay here a couple of nights. 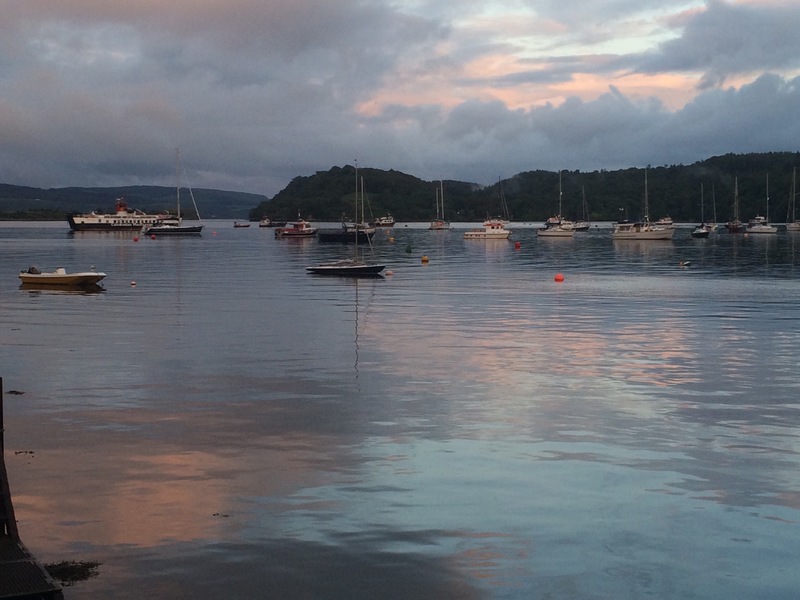 I drove to Mallaig early evening to take a look at this final town on the Morar peninsula. 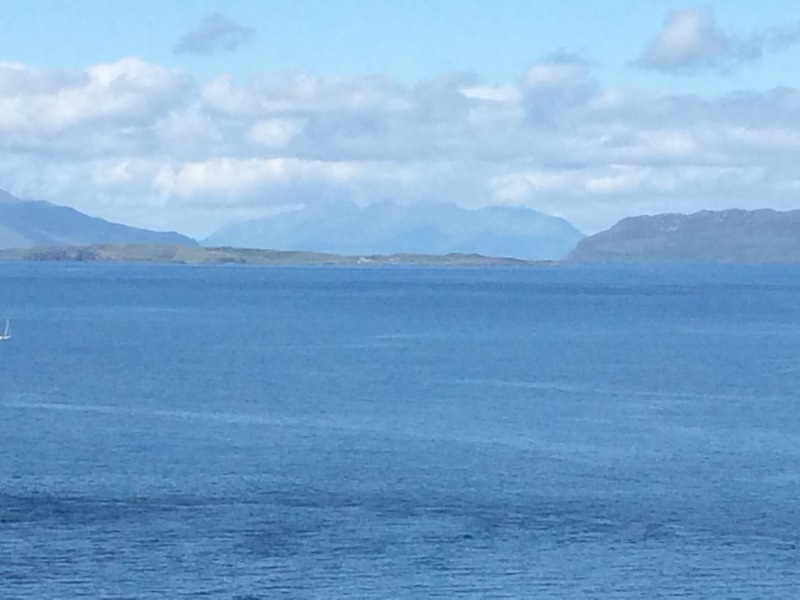 Ferries operate from here to the Small Isles, Knoydart and Skye. I had a nice dinner in The Clachain pub and took advantage of the very slow wifi.